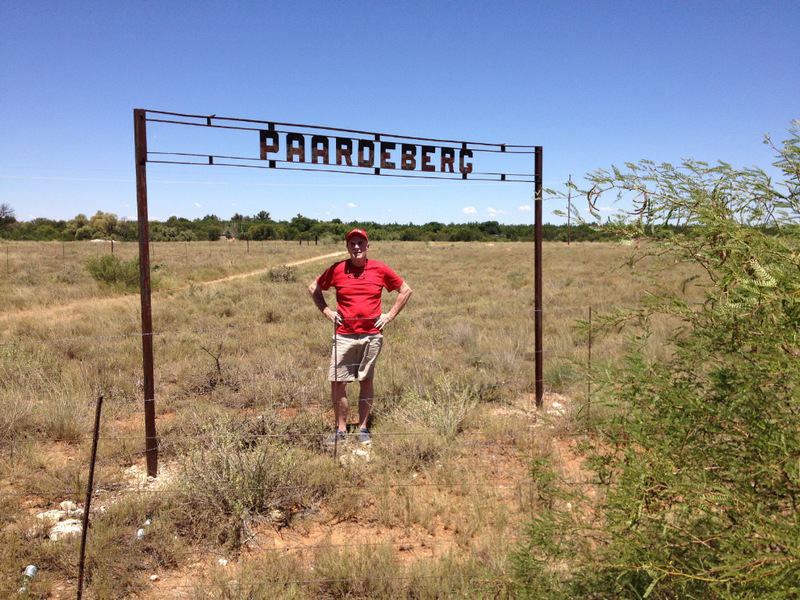 My earlier Post on “Paardeberg (Finding the Canadians)” covers our trip with Sheila (Sam) and John Denner to Kimberley and the Paardeberg Battlefield. 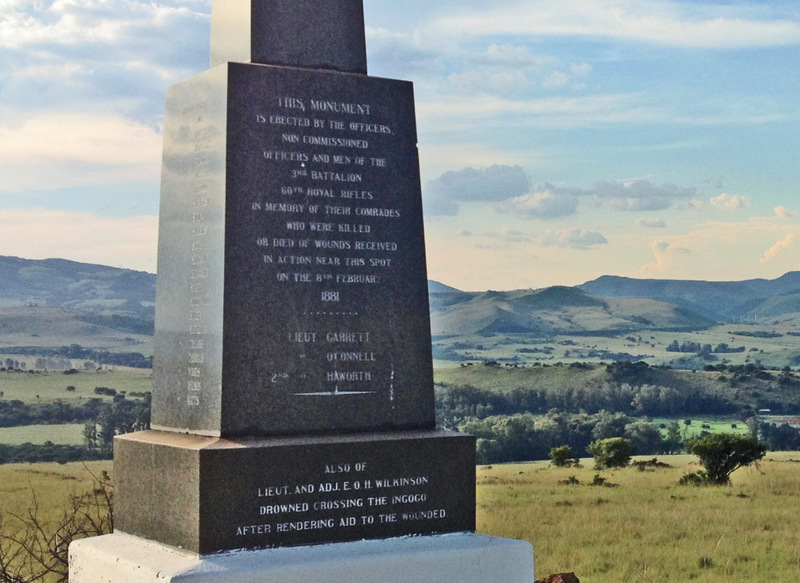 The follow-on trip took us to Kwazulu-Natal where we visited a number of battlefield sites, some of which were described in the similarly captioned Posts, Parts 1 and 2. 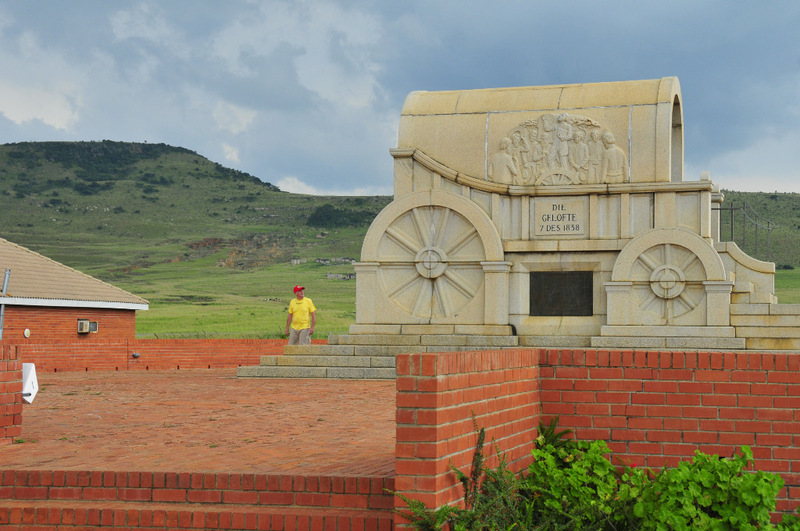 This post takes up the next leg of the trip, covering more of the battlefield sites identified by John over the northern and central parts of Kwazulu-Natal (KZN) province, which lies in the north-east quadrant of South Africa. 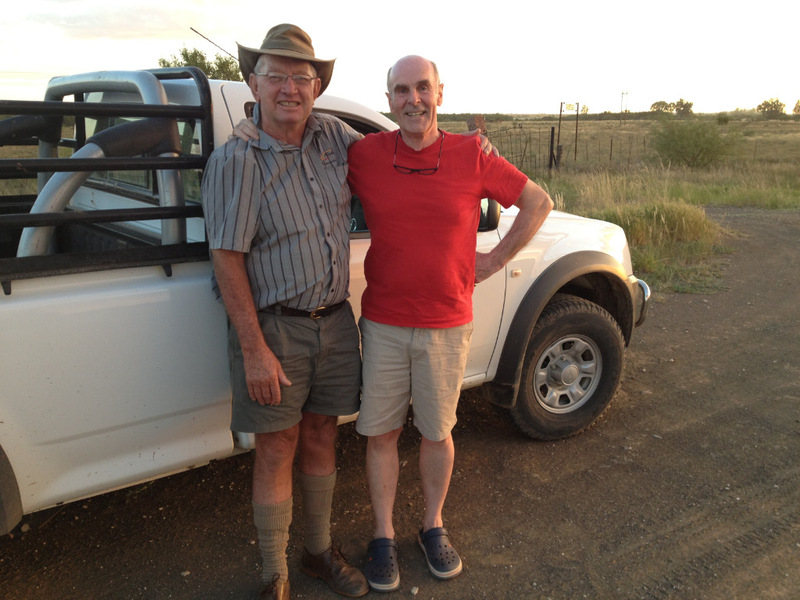 We continued to enjoy the wonderful hospitality of Pieter and Anlia Genis , family of my wife Gerda, who farm near Vryheid and who had offered their farm as a base for us to visit the various battlefield sites. They went far beyond normal hospitality in driving us around and providing meals and a place to sleep for four days – they surely deserve a medal! 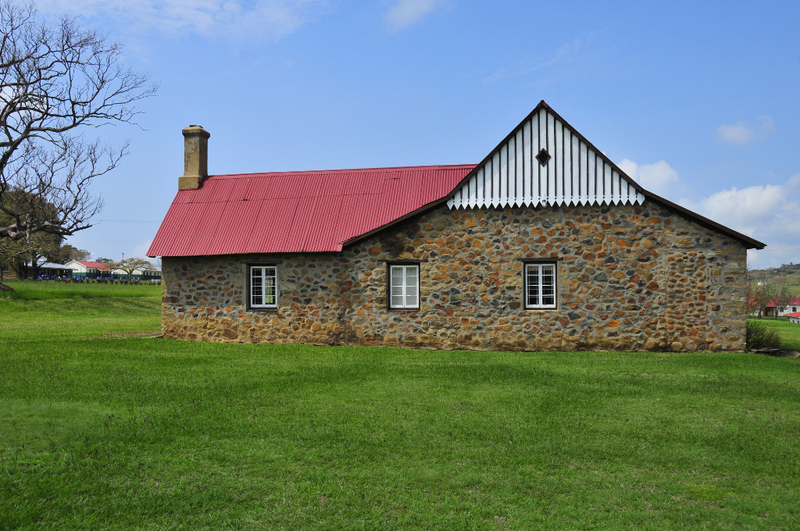 Next on our agenda were the well-known sites of Rorke’s Drift and Isandlwana, where fierce battles took place between the British and the Zulu nation. 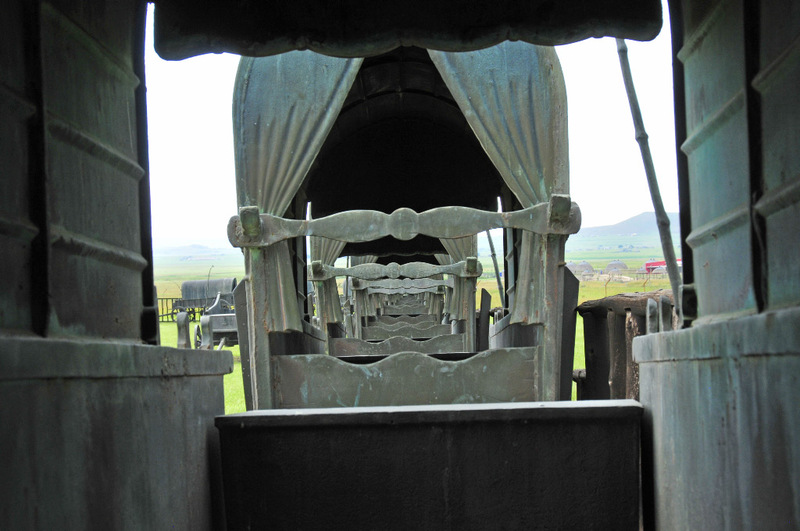 To close out our KZN visit we tracked across the province to visit the Ulundi battlefield and the nearby sites of Piet Retief’s grave and the mock-up of Dingaan’s Kraal. 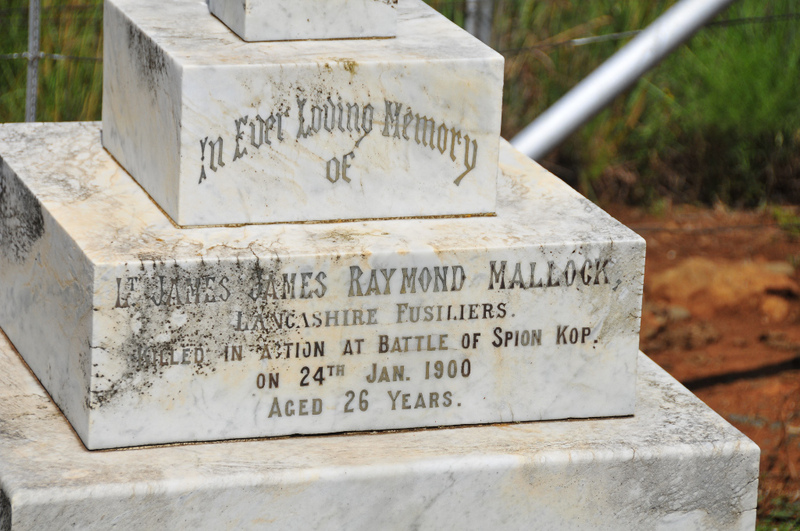 Lastly we visited the site of the Battle of Khambula, just a couple of km’s from where we were staying on the farm. 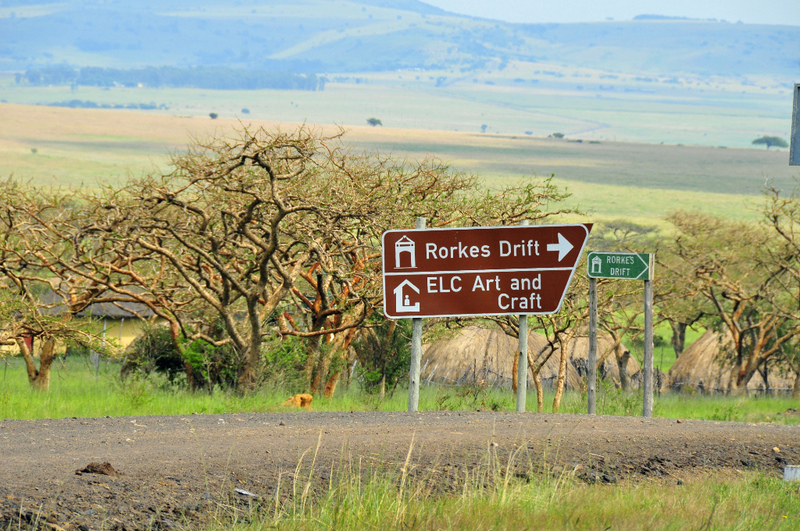 Following an early farm breakfast, we traveled via Dundee to Rorke’s Drift, arriving just after 10h00. 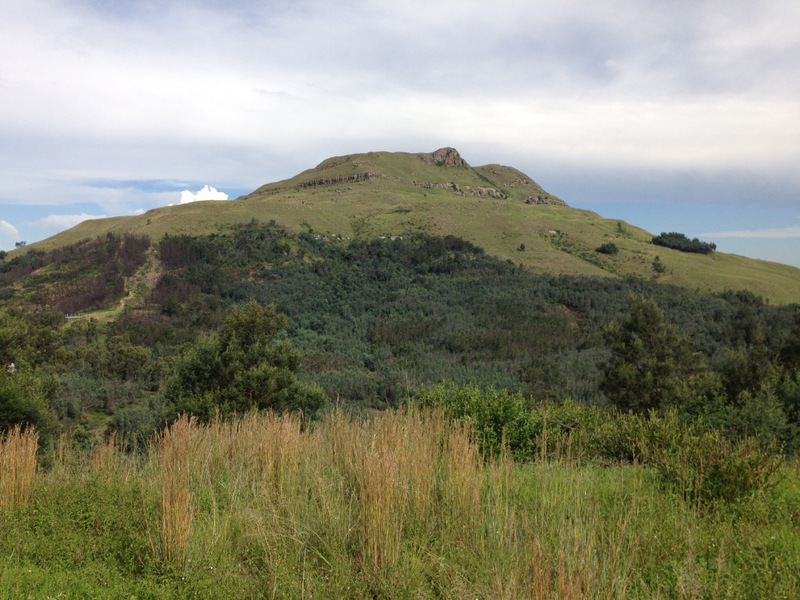 This was the site of a heroic defence, by around 100 men, of the hospital and surrounds against thousands of Zulus. 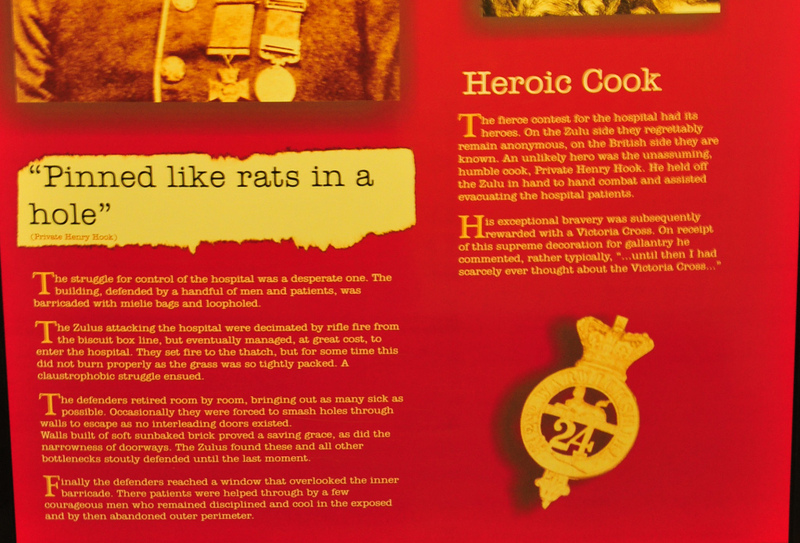 The house used as a hospital has been reconstructed on the old foundations and acts as a museum, while the immediate area that was successfully defended is marked out with white stone lines, making it easy to picture just how the battle progressed and where the main lines of defence were positioned. 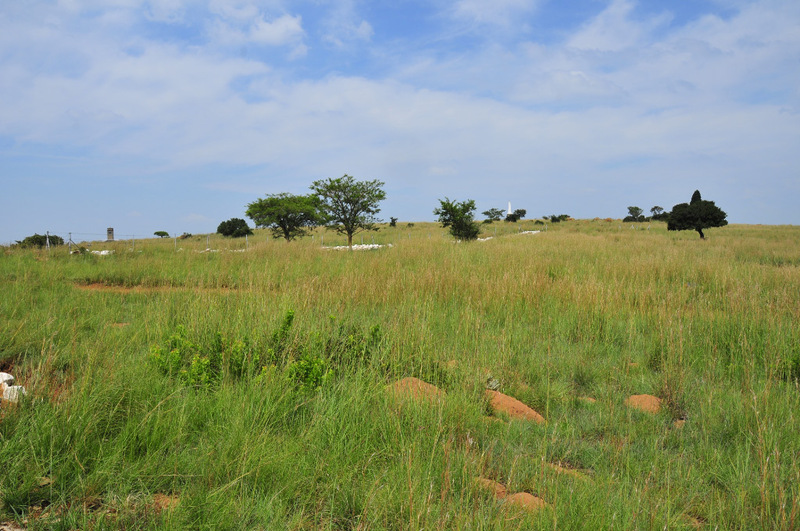 We walked up to the ridge where numbers of Zulus hid in caves and fired downwards at the British defenders – now one looks down on the local school grounds and some scattered dwellings, which seems a waste of an opportunity to turn the site into a significant attraction, famous as it is throughout the world. 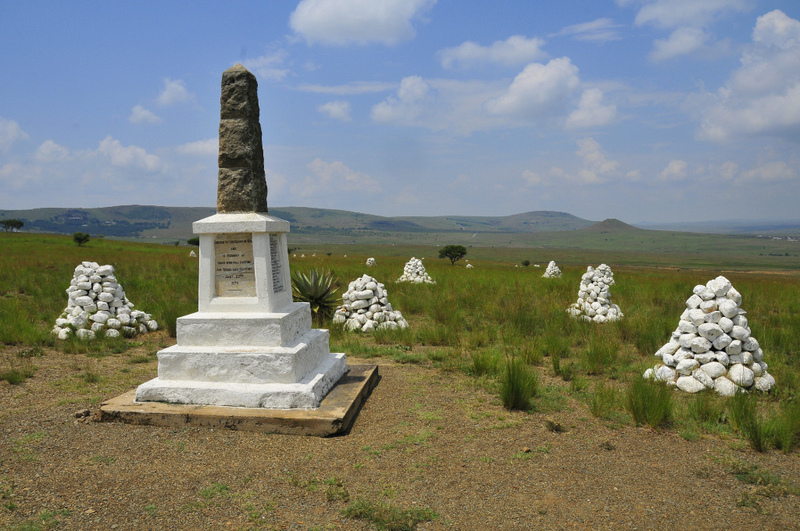 This battle started on the same day as the Battle of Isandlwana, continuing to the next day, and it soon became clear that the two battles are inextricably linked. 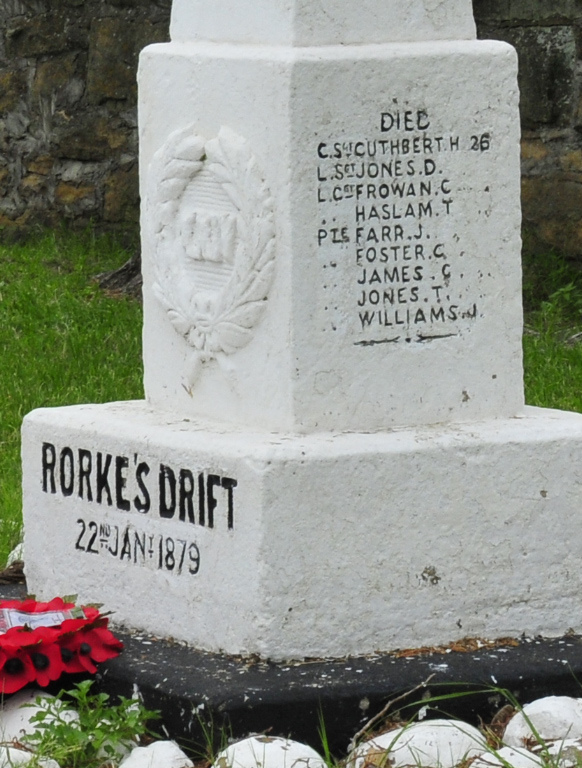 With the main British column being involved in the invasion of Zululand, just 104 men were left at the camp at Rorke’s Drift, on the border between Natal and Zululand, at a point where a drift provides a crossing point across the Buffalo River. The hospital was looking after 39 sick men. 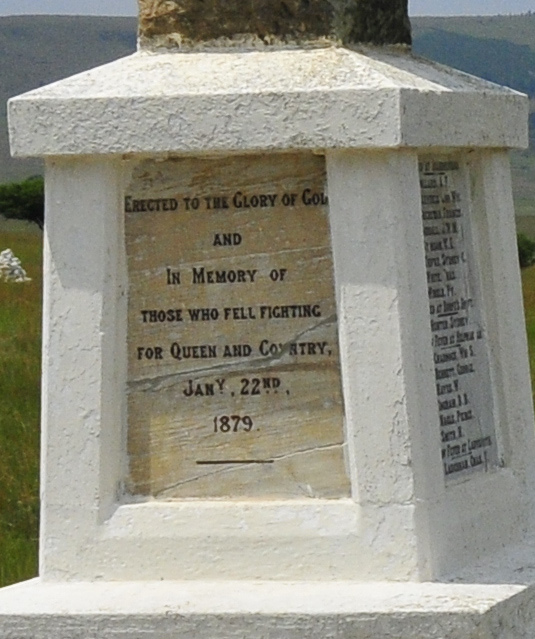 Hearing of the battle at Isandlwana and receiving reports of Zulu warriors heading in their direction, the men left at Rorke’s Drift set up barricades close to the hospital using biscuit tins and bags of mealie meal and prepared for the onslaught, which came in waves of Zulu warriors numbering about 4000 in all. Eventually some of them gained access to the hospital and the British broke holes in the walls to escape to the outside barricaded area, taking the hospital patients with them. 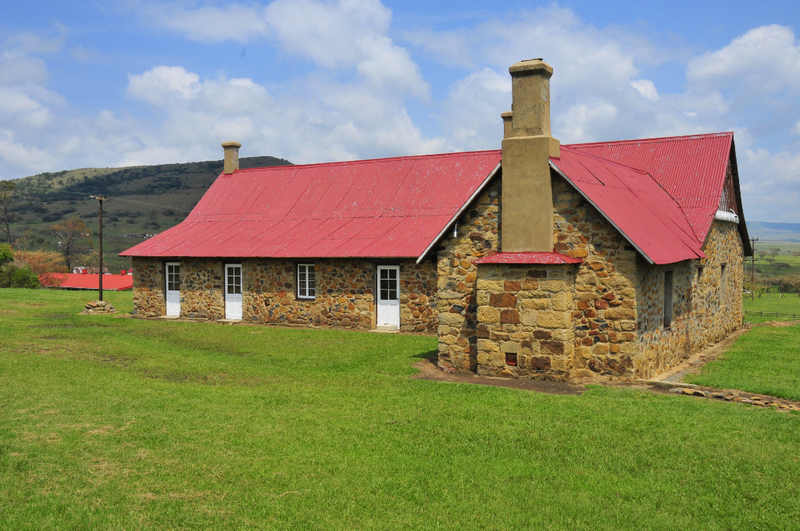 The Zulus continued to attack throughout the night and managed to set fire to the thatched roof of the hospital, but were repulsed each time – at first light the Zulus withdrew when they saw some of the remaining forces who had managed to escape from Isandlwana returning to Rorke’s Drift. 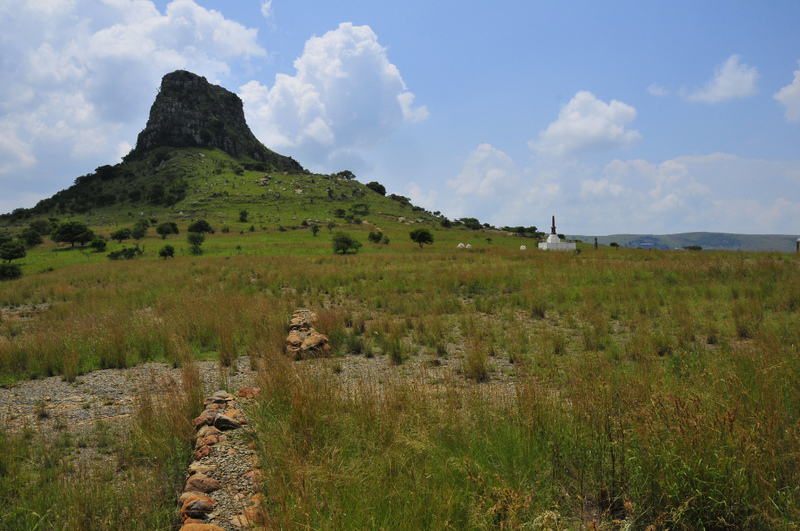 Isandlwana was our next stop, not too far along the road. 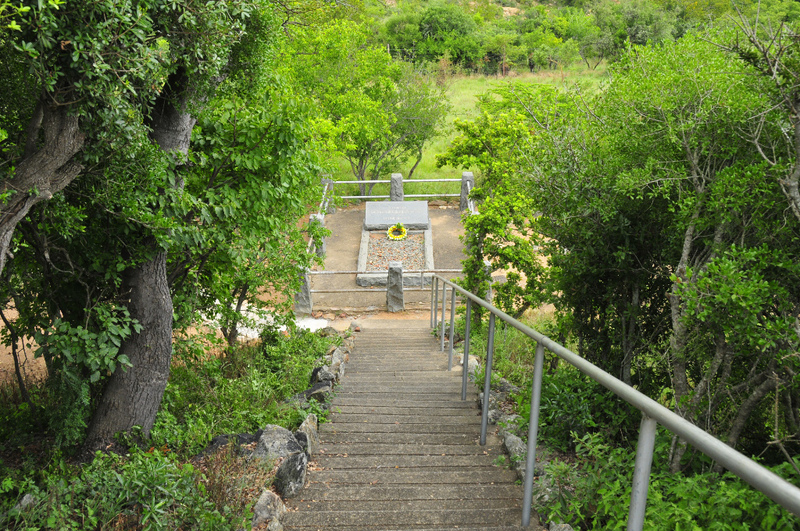 A number of monuments commemorate the battle and tens of stone crypts are dotted across the vast site, marking the spots where the fallen soldiers were buried. 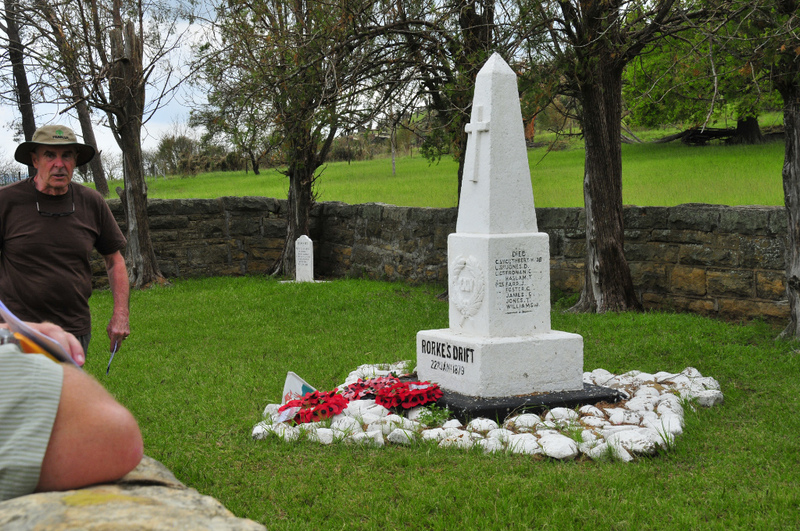 The battle took place on the same day as Rorke’s Drift, when a massive Zulu force wiped out about 1300 British soldiers, making it one of the most disastrous battles for the British and a major triumph for the Zulus. 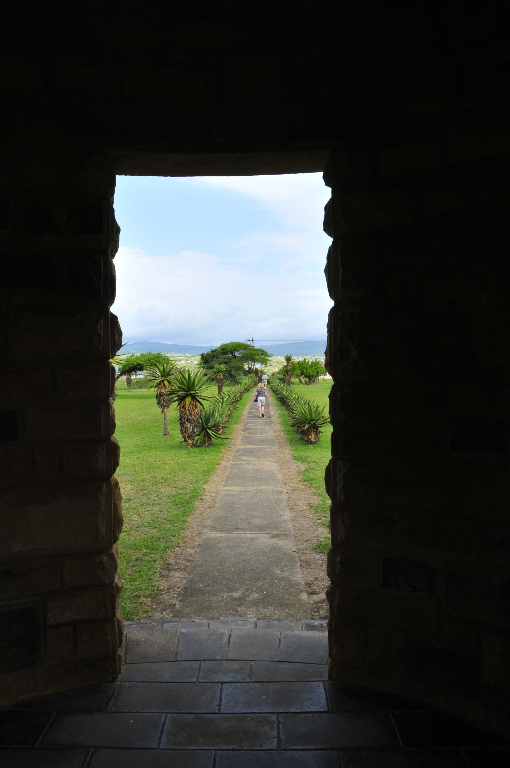 The British army invaded Zululand in 3 separate columns, of which the central column consisted of some 4500 men under Lord Chelmsford, who were headed in the direction of Ulundi, the seat of the Zulu king, Cetshwayo. 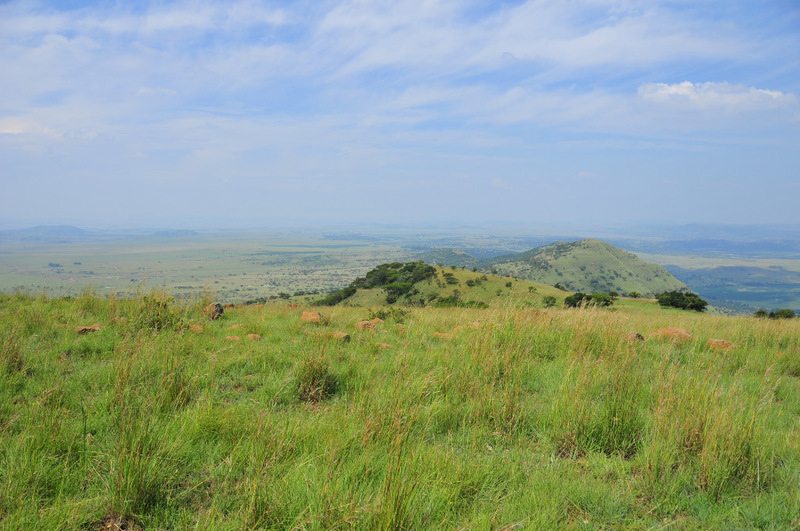 At the same time the Zulu army of some 22000 warriors had left Ulundi and were heading towards Rorke’s Drift with orders to engage the British forces. 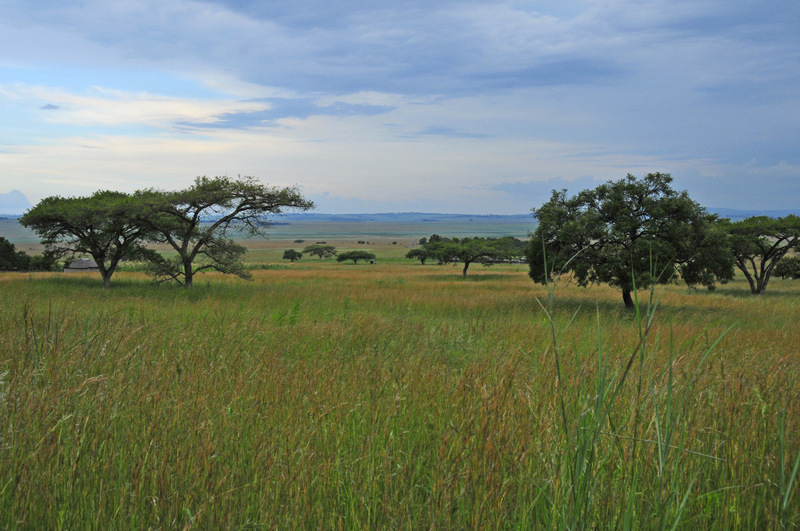 The Zulus employed an attack strategy known as “the horns-of-the-buffalo” formation and eventually surrounded the depleted British forces who began to retreat. The battle ended in disaster for the British, as all men who stayed to the end were killed, with 1329 British dead in total. 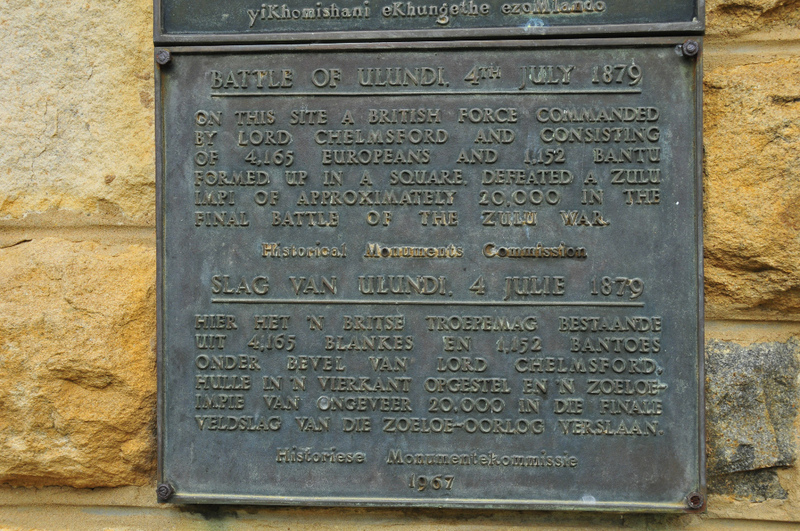 The Zulus also suffered around a 1000 dead, making it an expensive victory, which turned out to be short-lived when the British came out victorious some 5 months later at the final battle of the war at Ulundi. 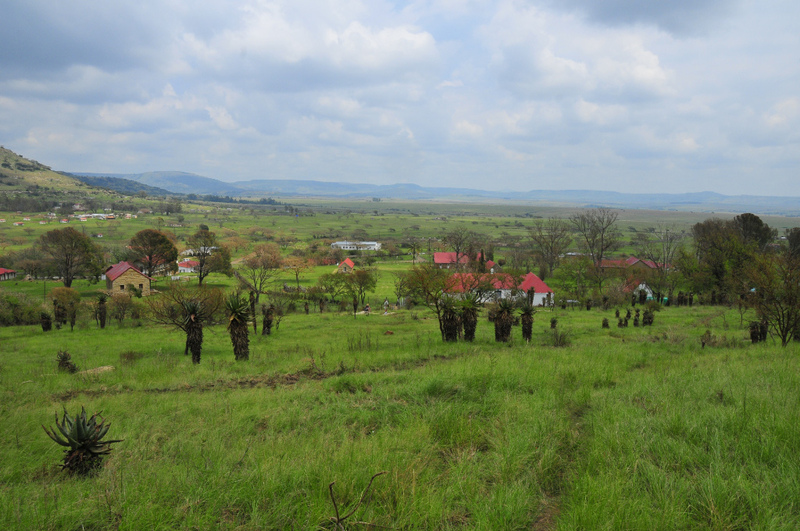 The site is south-east of Dundee in KZN – travel on the R 68 to Nqutu where you turn right in town then take the R 68 further to Melmoth – the turn-off to the site is about 14 km out of Nqutu. 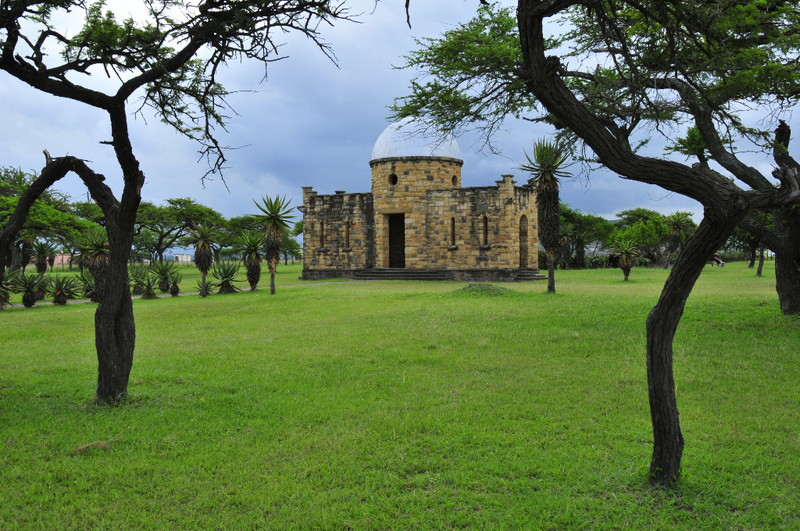 From Isandlwana it was a long drive along some very rough back roads, expertly negotiated by Pieter in his Nissan Pathfinder, via Babanango to Ulundi where the final battle of the Anglo-Zulu War took place. 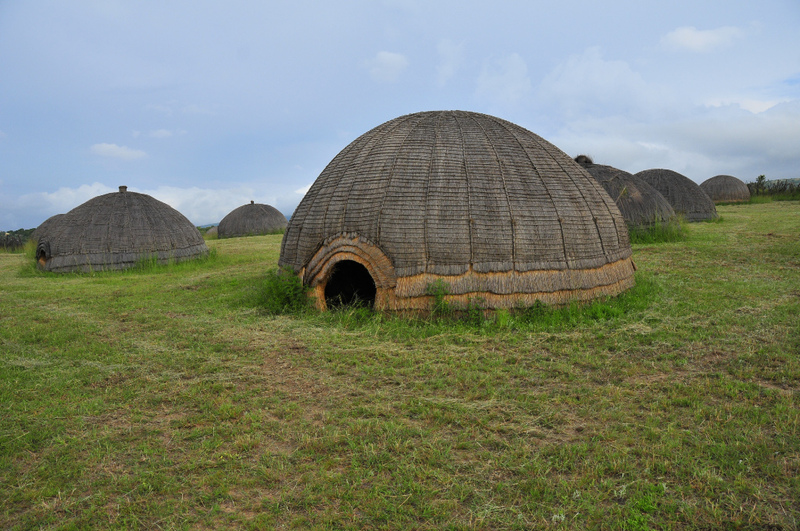 The site is well-preserved and presented, with a commemorative domed building in the middle of the site and pathways radiating out from the centre, delineating the area where about 5500 British soldiers were formed in a “fighting square” and managed to keep some 15000 Zulu warriors at bay. 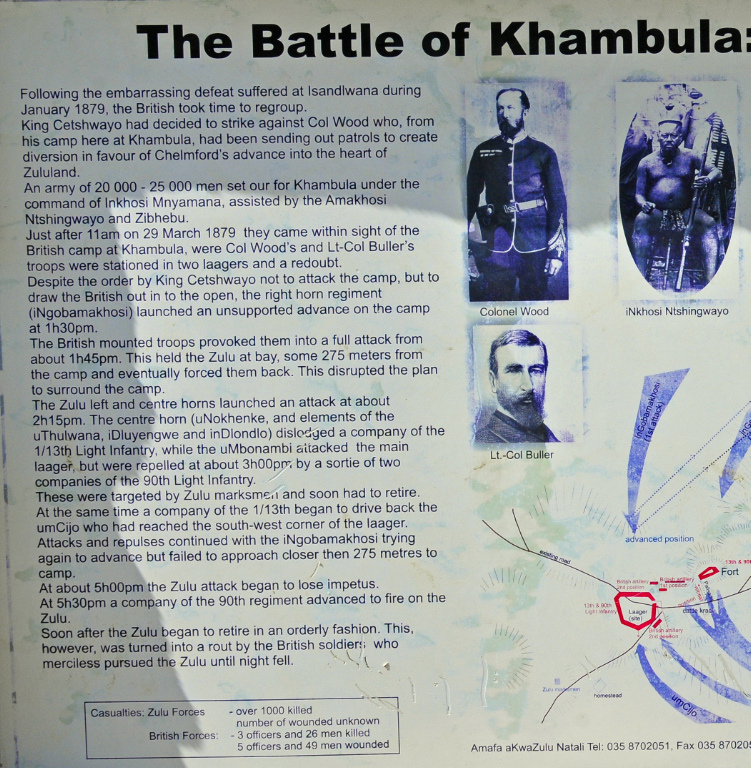 This was the final battle of the Anglo-Zulu war. 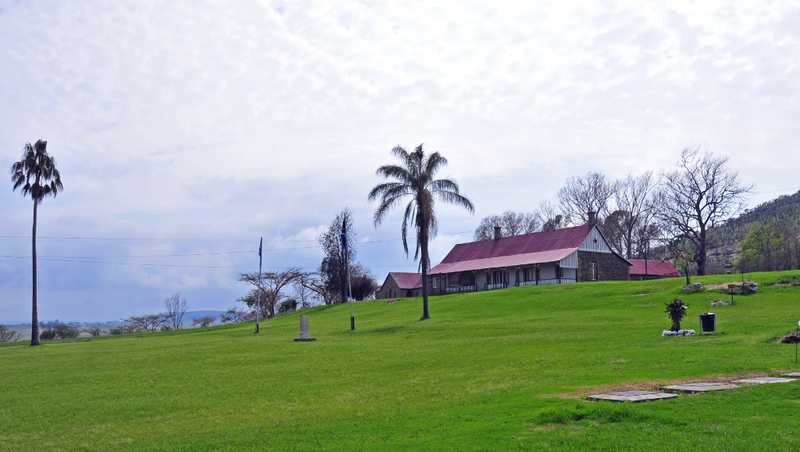 The British forces, numbering about 5500 men, were advancing on Ondini, home of Cetshwayo the Zulu king, formed into a fighting square with companies of fighting men on four sides with guns and wagons alongside them, covering an area of some 3.5 hectares. 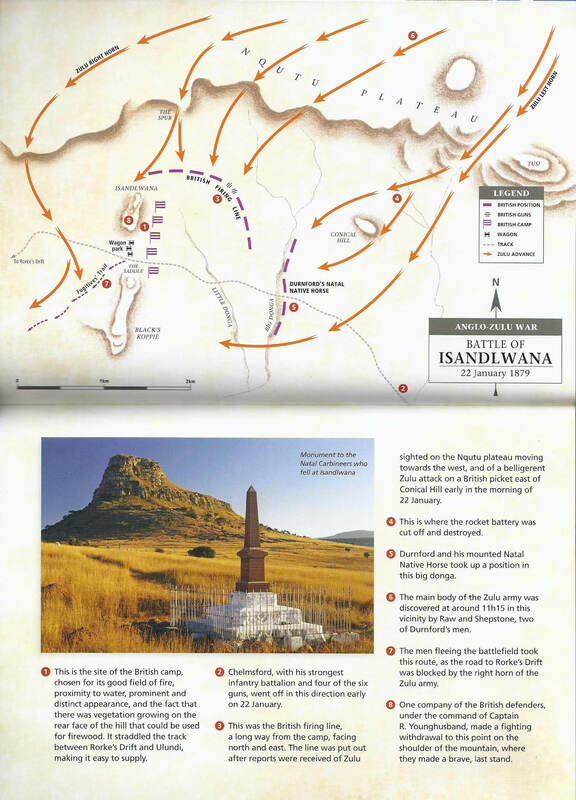 The Zulus employed their famous “horns-of-the-buffalo” formation and began to attack the British formation, but suffered huge casualties and were beaten back and subsequently pursued with many being killed, probably as a brutal revenge for the British losses at Isandlwana. 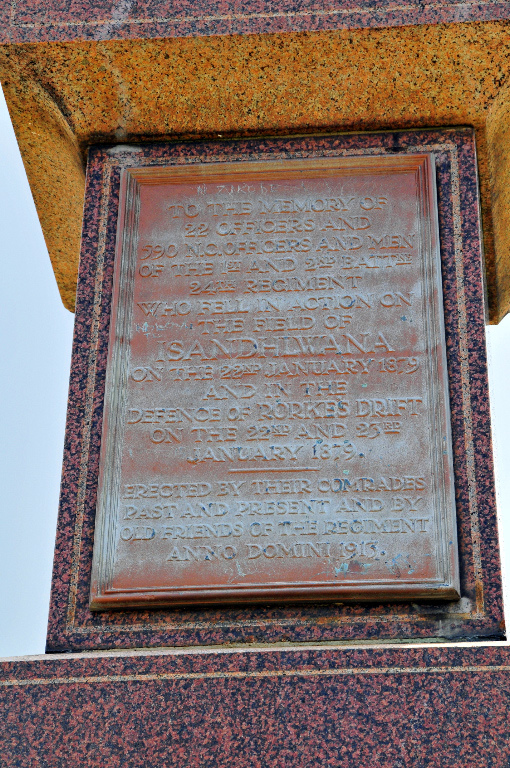 The British dead amounted to 12 men. 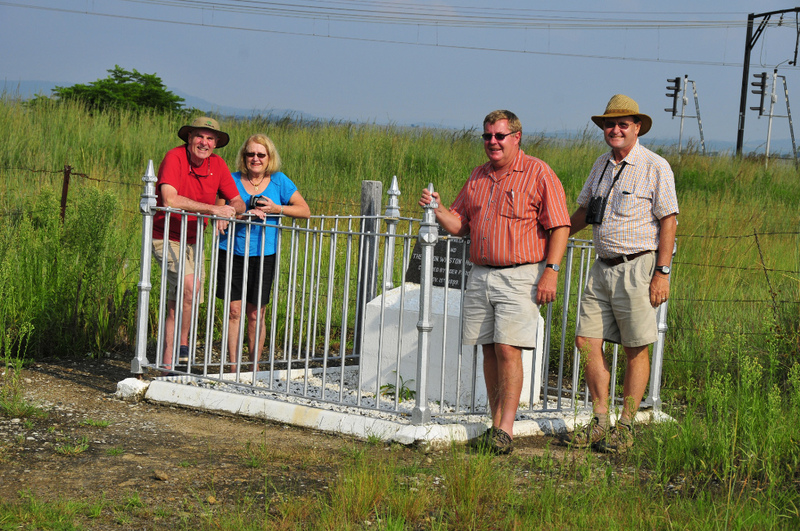 By this time it was getting late and we were all tiring after a long day’s drive – not surprisingly, we were wavering about whether to look for the site where Piet Retief was buried, but John was adamant that we should “pay our respects to old Piet”. 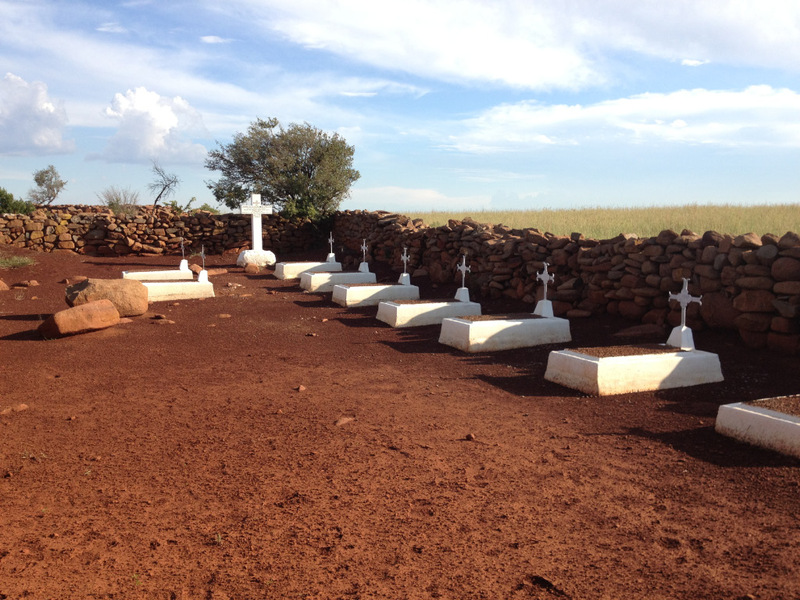 After a further short drive from Ulundi and a couple of wrong turns, we found the site at the end of a dirt road. 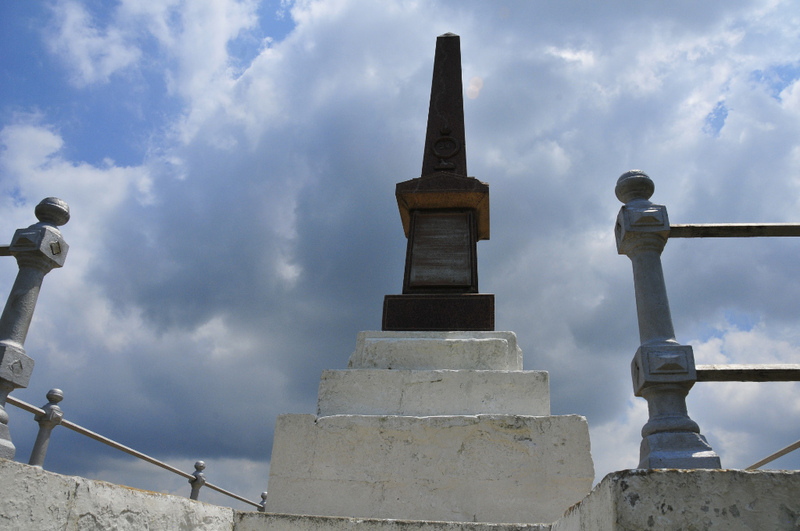 The grave of Piet Retief and the monument to him and the 70 burghers who were all murdered, was well-kept and quite moving to visit, knowing some of the history leading to this tragic event. 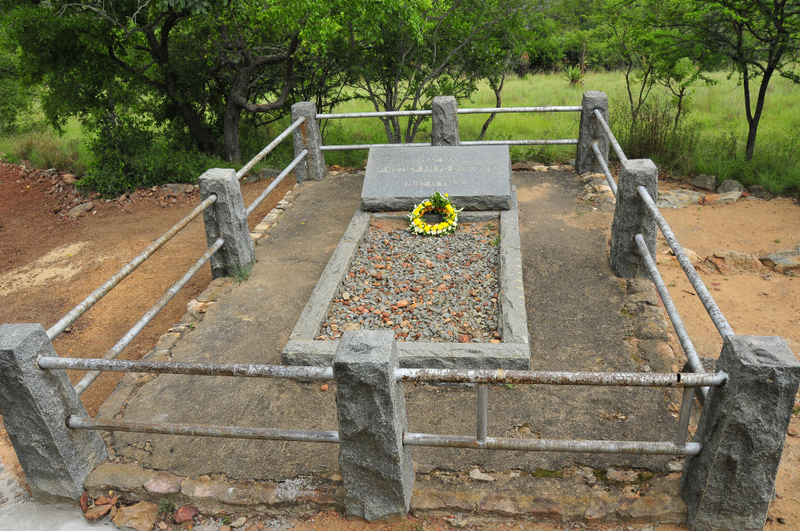 The Trekkers under Piet Retief were seeking permission to settle south of the Tugela River and he and his entourage entered into negotiations with the Zulu king Dingane at his homestead, but were all executed on Dingane’s orders. 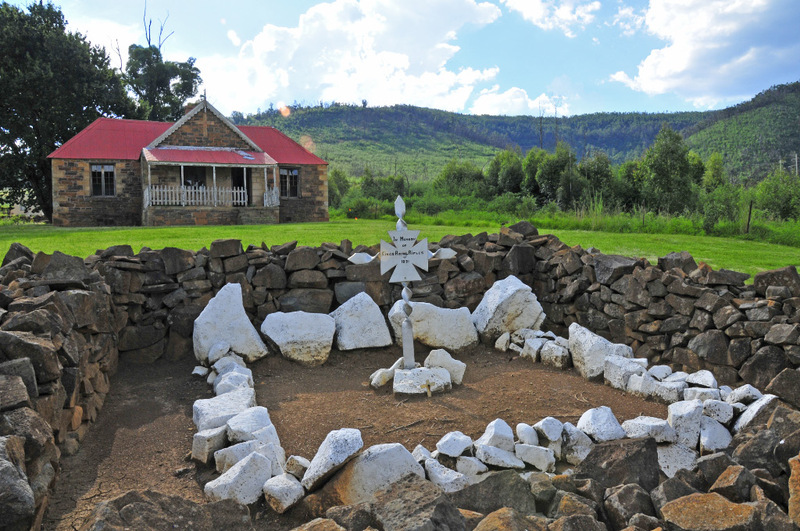 We followed this up with a look-in at the nearby mock-up of Dingaan’s Kraal which has been re-created in the same position that it was at the time of the murder. 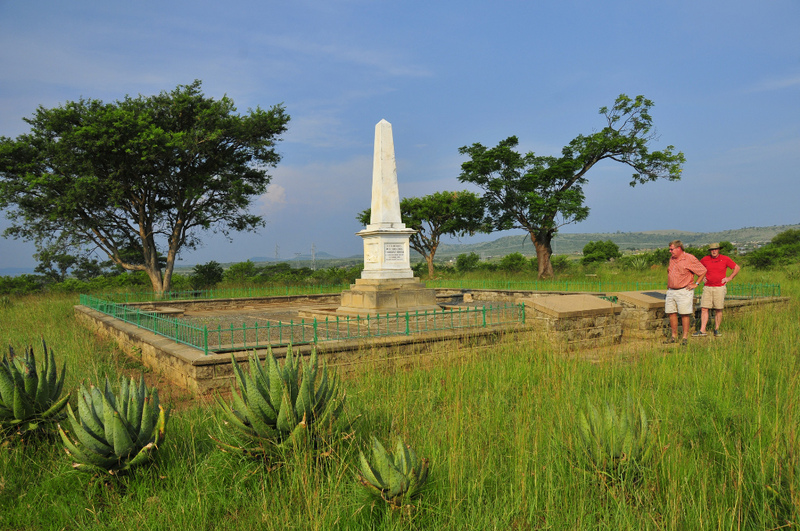 Very close to the grave of and monument to Piet Retief and his entourage – best to visit both in one trip. 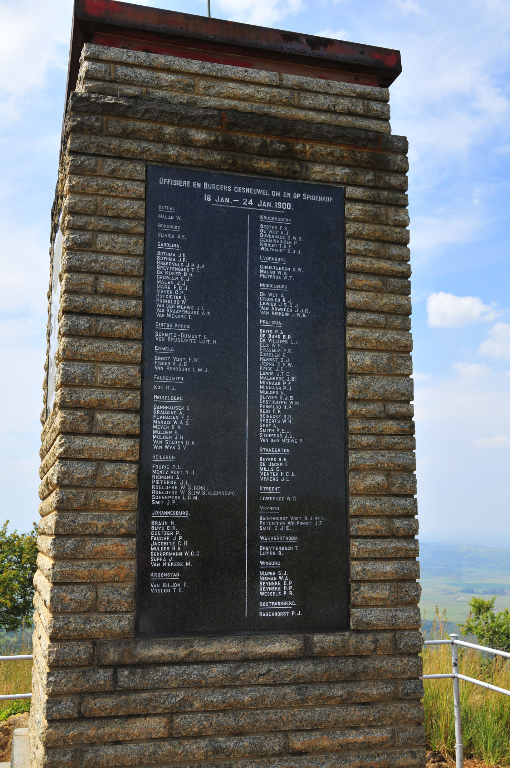 The closest battlefield site to the farm, just a few km’s away, is that of the Battle of Khambula, which Pieter took us to view before returning to Pretoria. 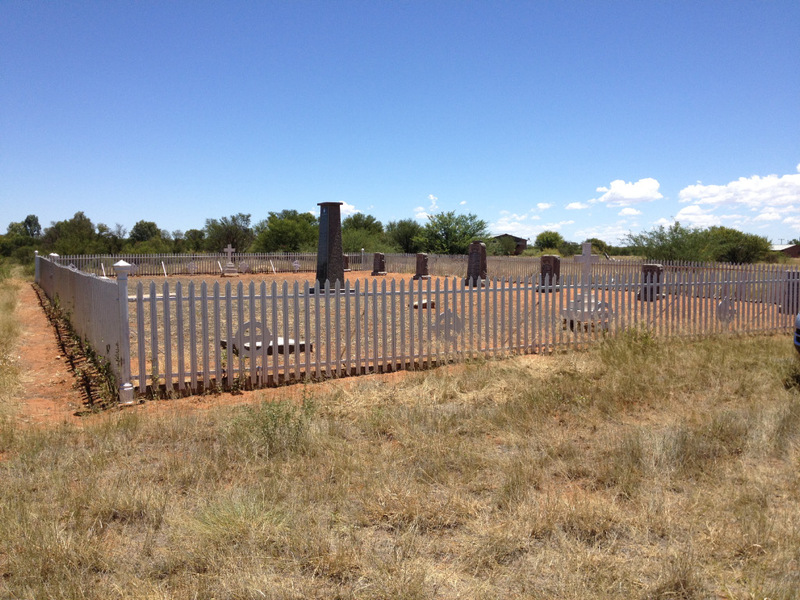 Once again we were pleasantly surprised to find the cemetery and monuments well-kept, despite it being on private ground and not being one of the “popular” sites, so probably visited very infrequently. 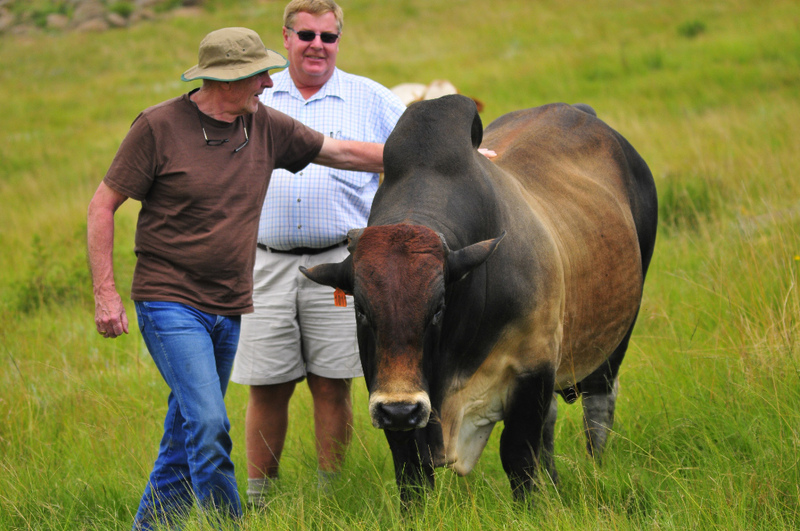 In between travelling to the sites we continued to enjoy the hospitality of Pieter and Anlia – before departing for Pretoria, Pieter took us on a tour of the farm, including the grazing land for his herd of fine Boran cattle high up on the plateau, accessed by a mildly hairy dirt road that switchbacks up the side of the mountain. 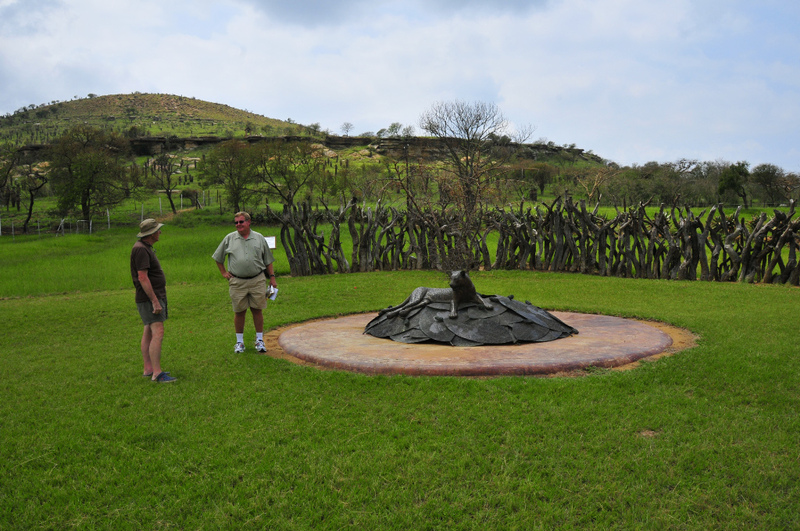 Having seen a lot of KZN in the few days at our disposal and having covered almost all of the battlefield sites on John’s “wish list”, we returned to Pretoria quite tired but well satisfied. 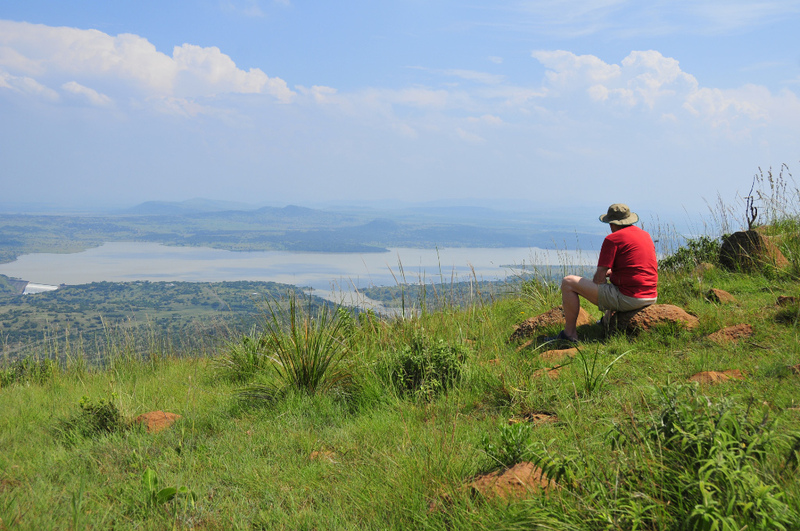 Next on the itinerary was a couple of days to take it easy, perhaps explore the Pretoria and Joburg area a bit and get ready for our trip to Kruger Park and the other attractions of Mpumulanga province, followed by a flight to George to “do” the Garden Route. 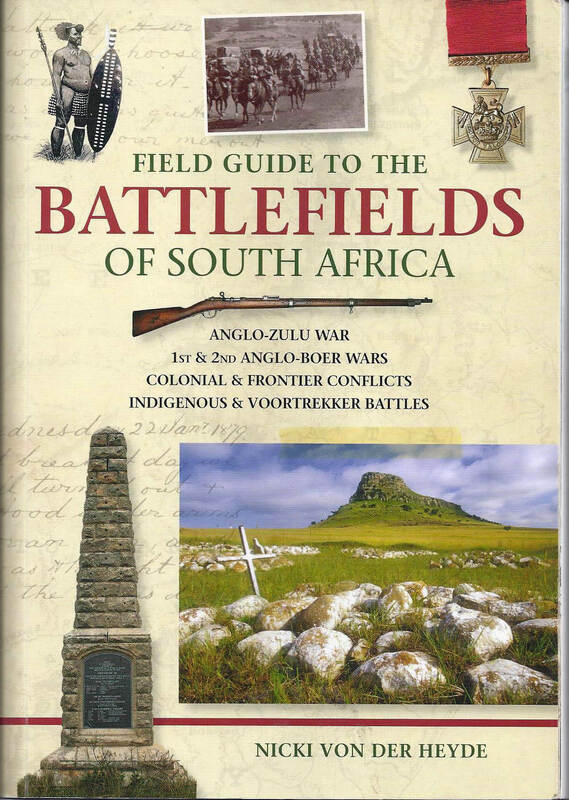 Special note : much of the detail info is taken from the excellent book Field Guide to the Battlefields of South Africa and summarised in my own words – the cover is reproduced below. 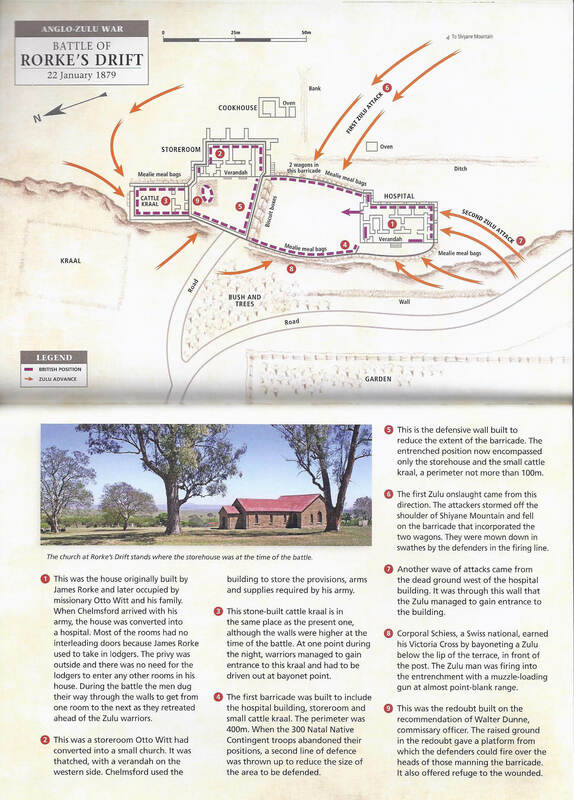 It is highly recommended for anyone seeking more info and intending to visit some of the sites. 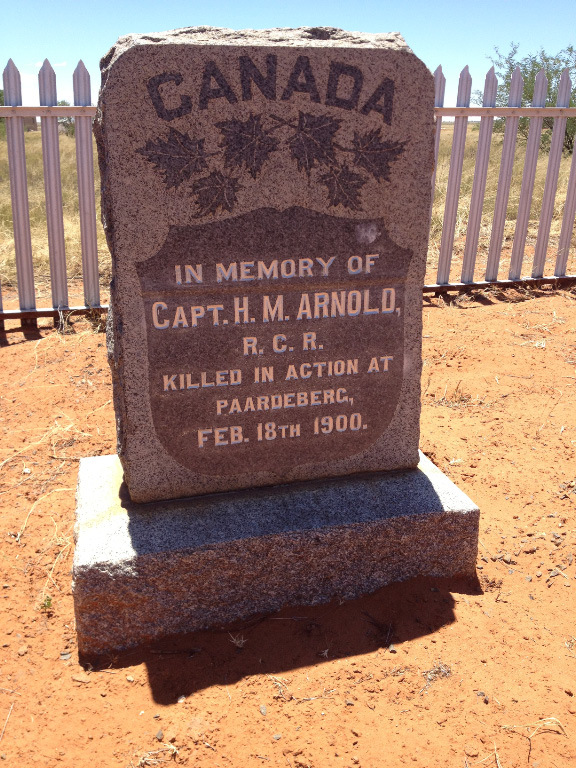 My earlier Post on “Paardeberg (Finding the Canadians)” covers our trip with Sheila (Sam) and John Denner to Kimberley and the Paardeberg Battlefield. 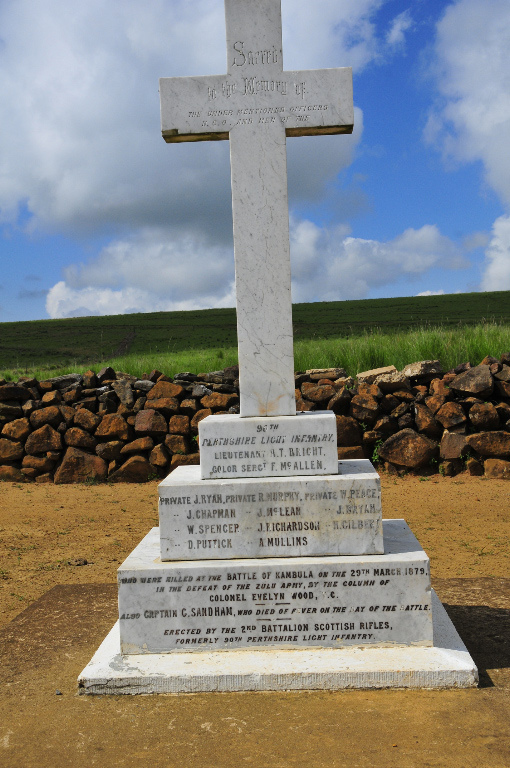 The follow-on trip took us to Kwazulu-Natal where we visited a number of battlefield sites, a few of which were described in Part 1. 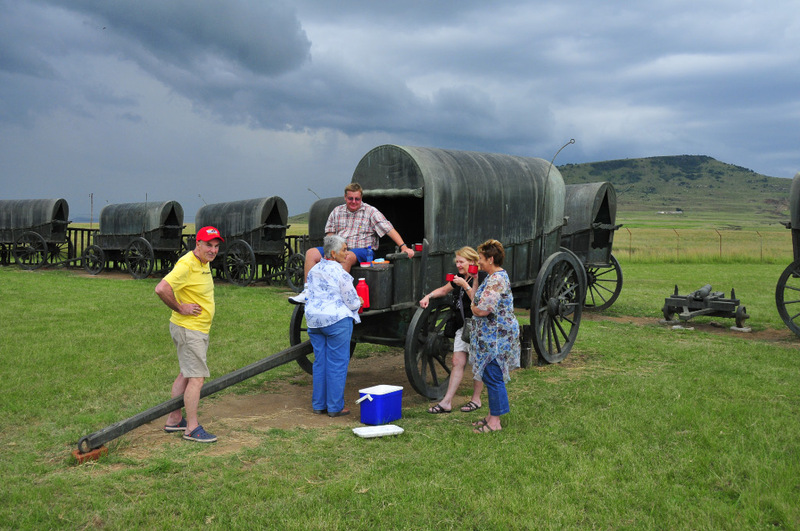 This post takes up the next leg of the trip, which was to cover more of the battlefield sites identified by John over the northern and central parts of Kwazulu-Natal (KZN) province, which lies in the north-eastern quadrant of South Africa. 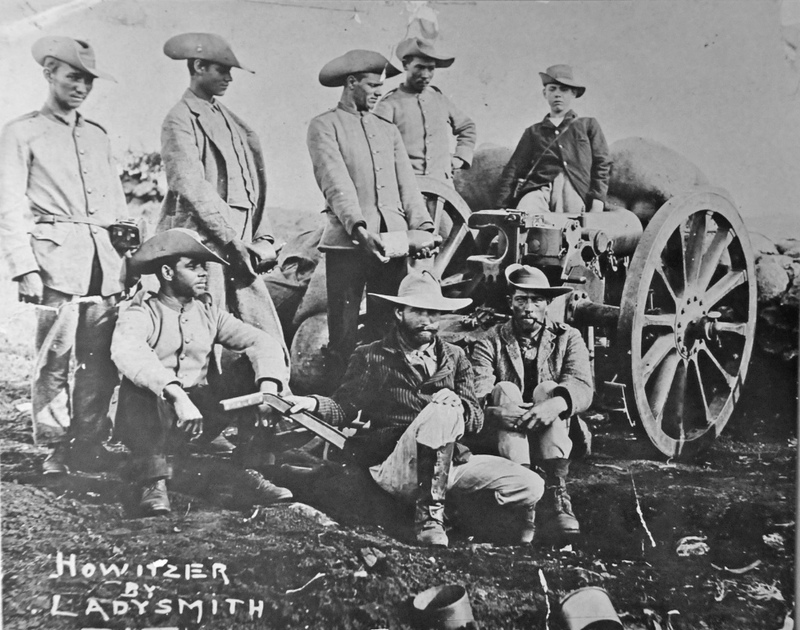 We decided to do the Ladysmith area next, with a number of battlefield sites in the area and the Ladysmith Siege museum on the agenda. 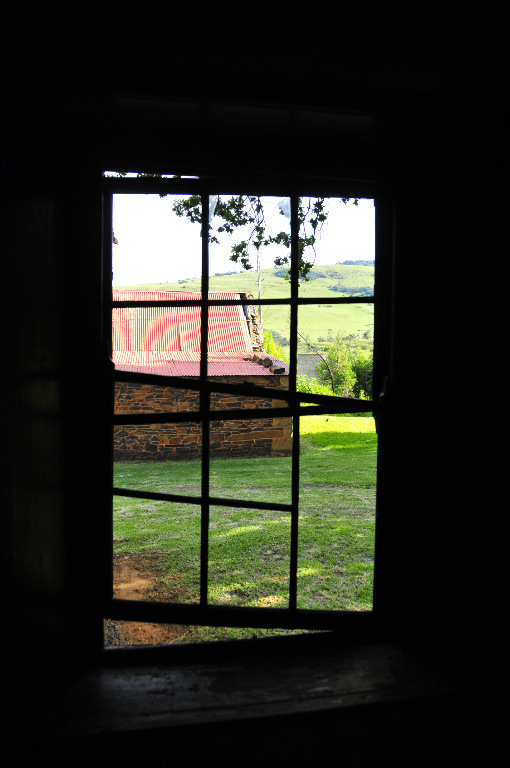 We left the farm after an early breakfast, to give us enough time to explore the area thoroughly and headed to Ladysmith via Dundee. Our first stop for the day was just off the main road at Elandslaagte, where we found the by now familiar, well-kept cemetery commemorating the fallen soldiers. Second War of Independence 1899-1902. 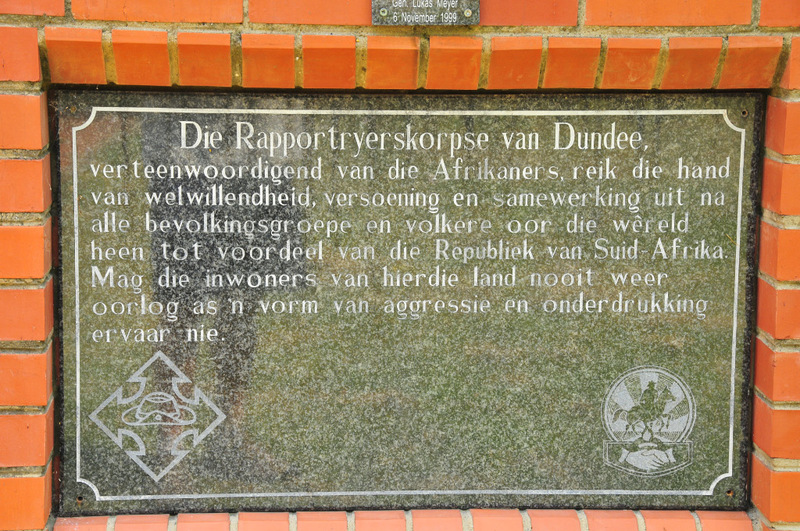 After the Boer ultimatum to the British, to withdraw troops from the Transvaal and Orange Free State, had expired, the Boers invaded Natal and in the process took Elandslaagte station between Ladysmith and Dundee. The battle ensued when the British sent troops to recapture the area and resulted in high casualties on both sides, with the British regaining control of the area. 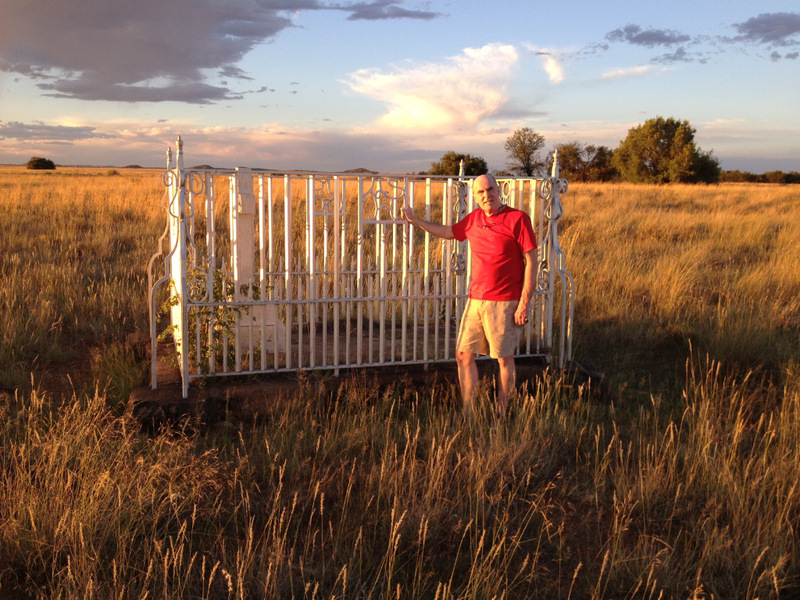 Signposted off the R 602 between Dundee and Ladysmith, cross the railway line and follow signs to the sites. 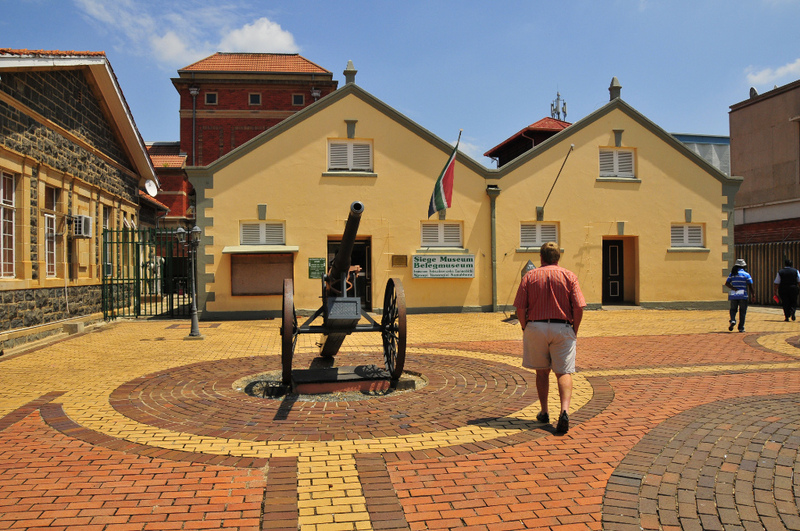 After a brief stop at the Information centre, we found the Siege Museum in Murchison Street – it turned out to be a very informative museum, not just about the Siege of Ladysmith but also about some of the battles in KZN and the circumstances leading up to them – it was well worth the visit. 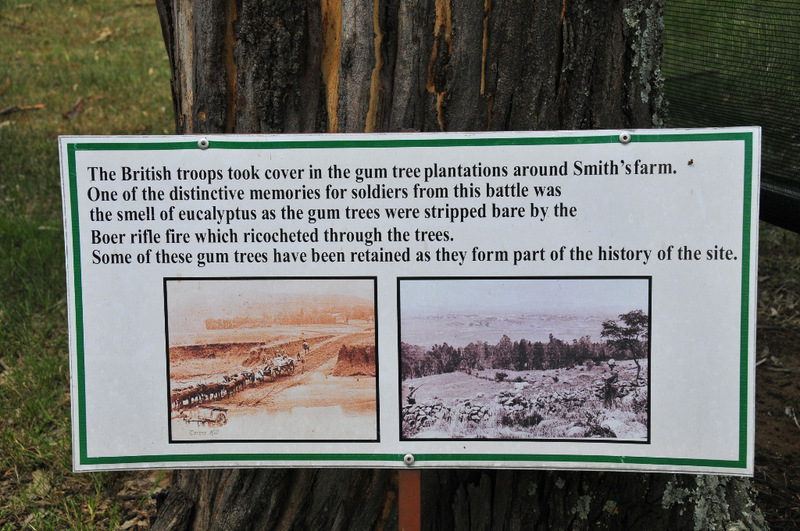 From early October 1899 the British had a garrison stationed at Ladysmith, which was swelled to 13000 by the garrison in Dundee after the Battle of Talana on 20 October and their withdrawal to Ladysmith. 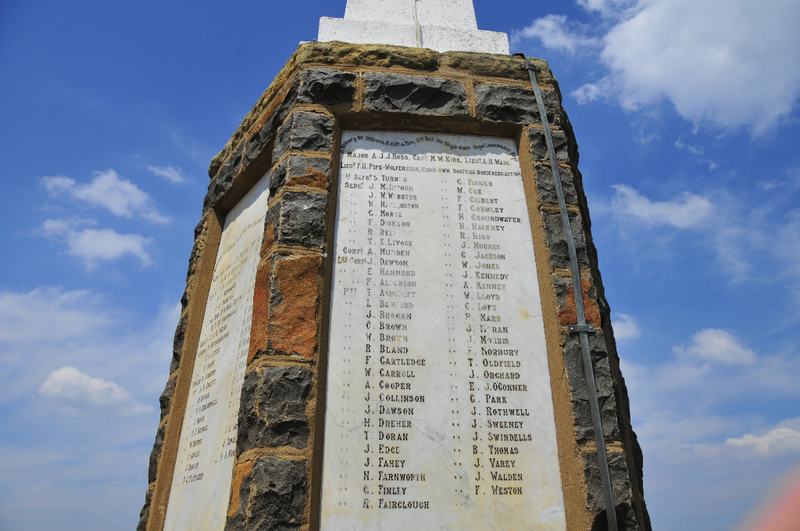 On 30 October the combined garrisons took on the Boers in the Battle of Ladysmith but failed to rid the area of the encroaching Boers – by November 1899 Ladysmith was surrounded and besieged and was only relieved 3 months later after much suffering. 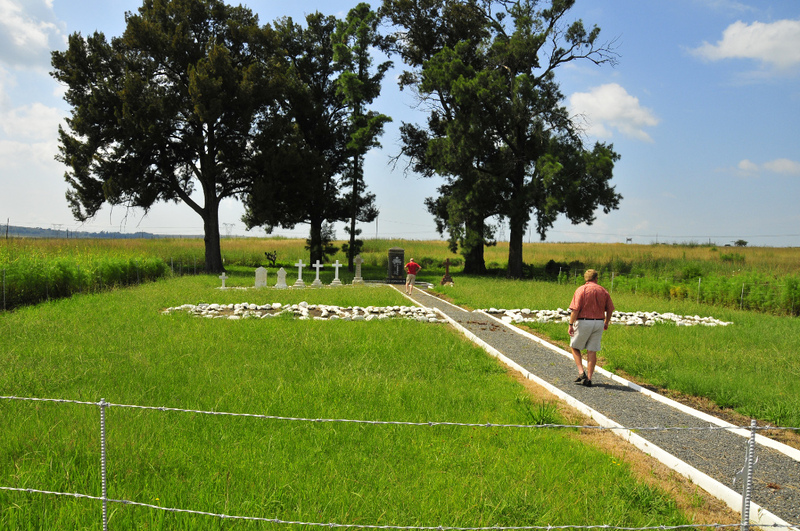 Our next stop was the Wagon Hill Battlefield and Cemetery, after once again having to contend with minimal signage and going on “gut feel”. 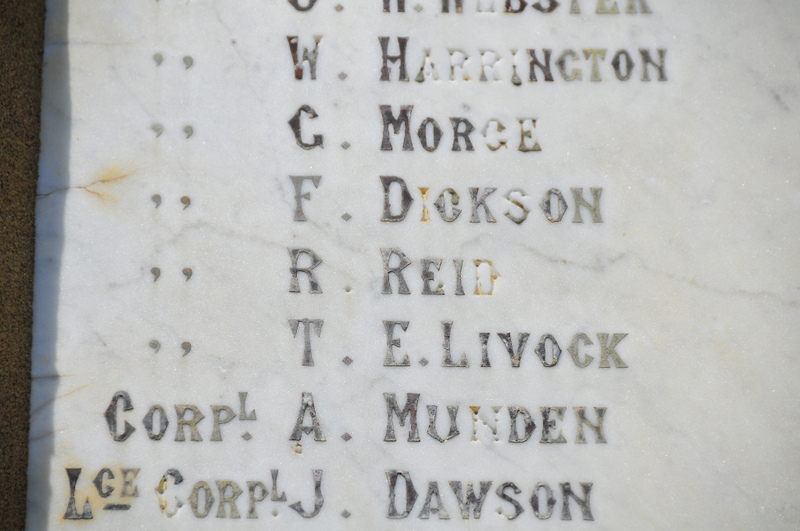 Reading through the names on the commemorative monuments, I came across Lance Sergeant R Reid of the Gordon Highlanders – not any direct relation but just brought it a bit closer to home, as did the others with our surname that we were to come across at other battle sites. Second War of Independence 1899 – 1902. 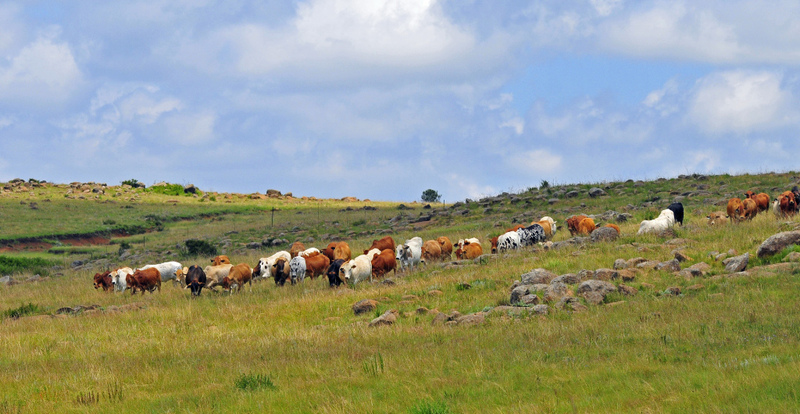 This was the Boers attempt to take this strategic hill, during the long siege of British occupied Ladysmith. 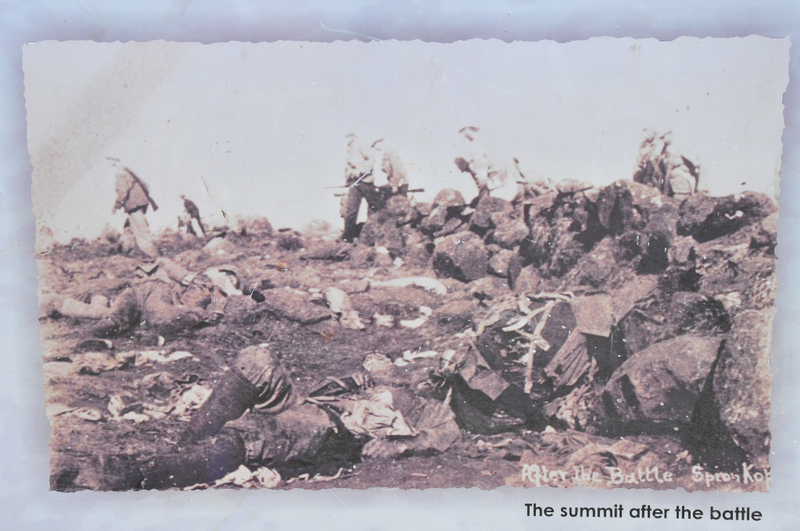 After a lengthy engagement the British managed to hold the hill, but suffered 183 men killed and 249 wounded while the Boer casualties were 68 men killed and 135 wounded. 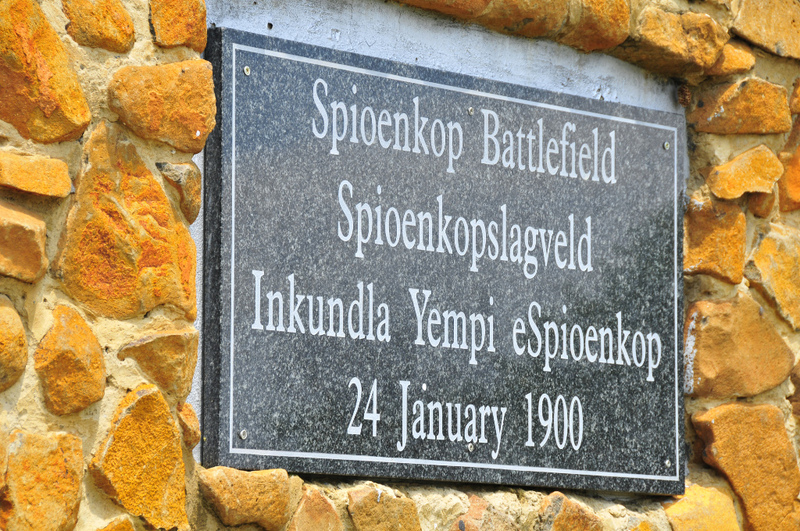 Moving on, our next stop was the well-known site of the Battle of Spioenkop, sited on a hill with magnificent views all round of the green landscape and the overflowing Spioenkop dam far below – we can enjoy the views today but on that day in 1900 it was the site of massive losses of young soldiers on both sides as the British forces tried to defend the hill against the attacking Boers. 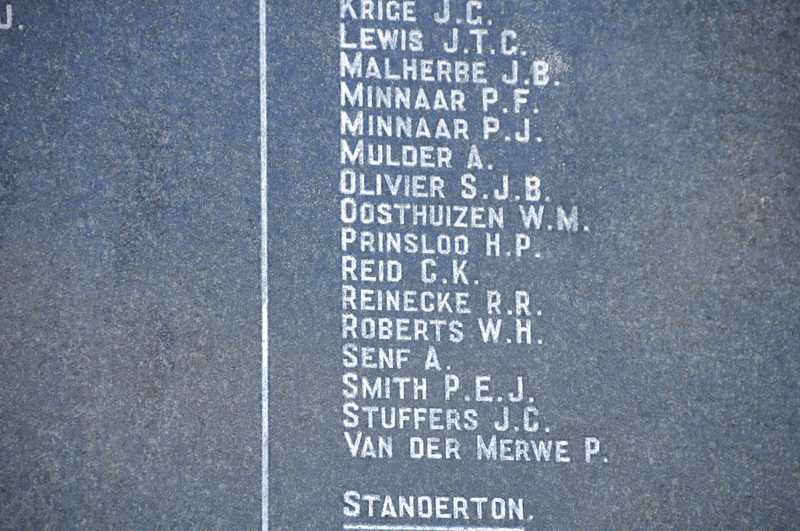 As with Wagon Hill, I came across the Reid surname 3 times amongst those who perished – interestingly, two Reid’s appear on the British memorial while one was listed with mostly Afrikaans surnames on the Boer memorial, which was also the first time we had come across a formal Boer memorial at a battlefield site – apparently the Boers tended to remove their casualties to be buried elsewhere, even taking them home again. 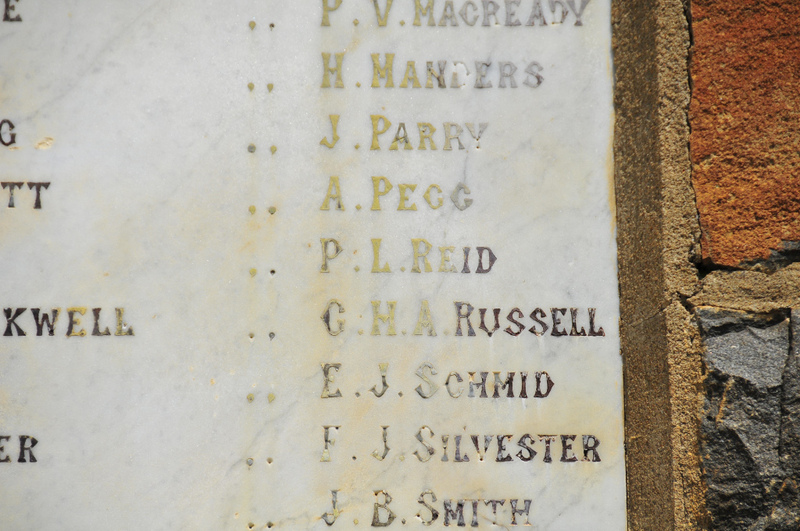 The Reid’s commemorated were Private PL Reid and Sergeant R Reid on the British side and CK Reid from Pretoria on the Boer side. 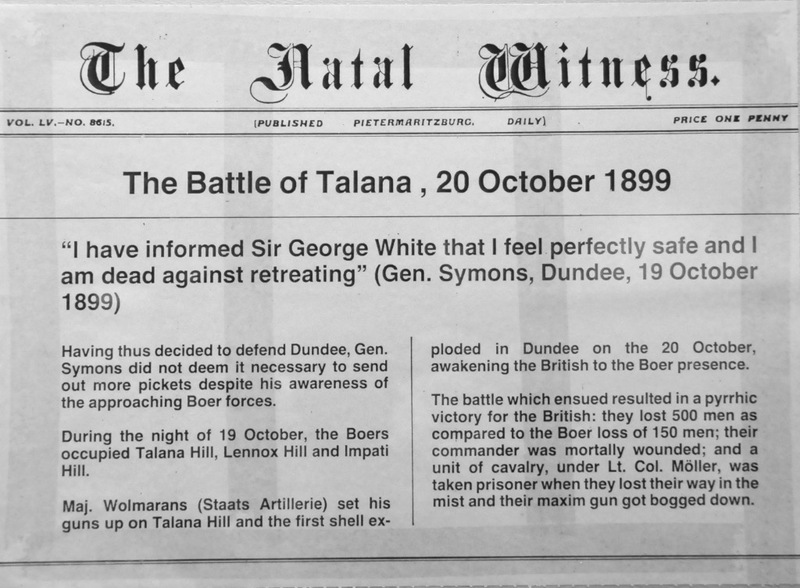 This was the climax of a week’s fighting on the north bank of the Tugela river, with the British attempting to break through the Boer line. 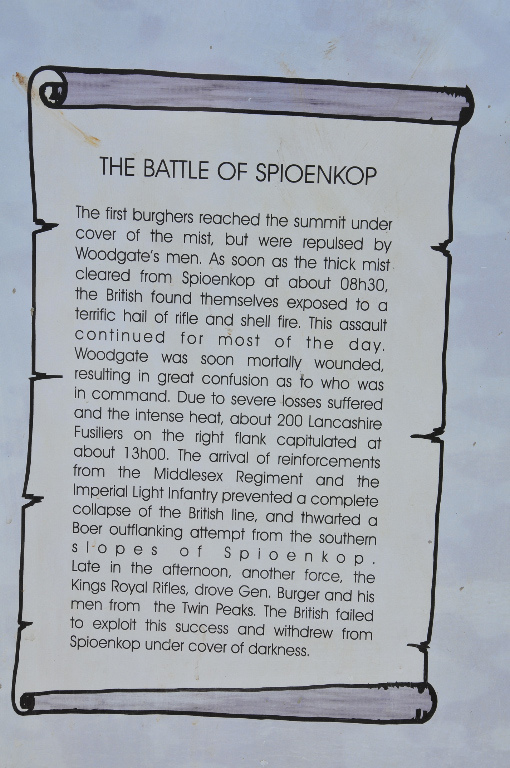 The battle began after midnight with the British taking the hill early morning, but they were subjected to heavy artillery fire from the Boers below, followed by a day long battle that ended with neither side claiming a decisive victory. 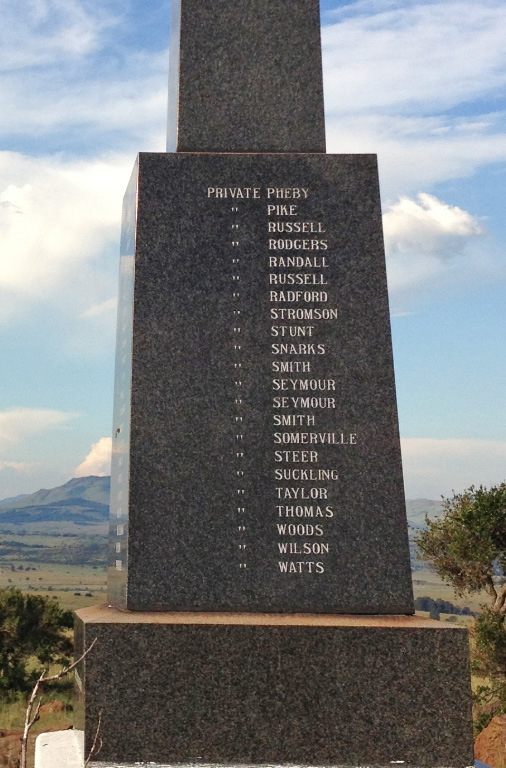 There were massive casualties on the British side, less so on the Boer side. 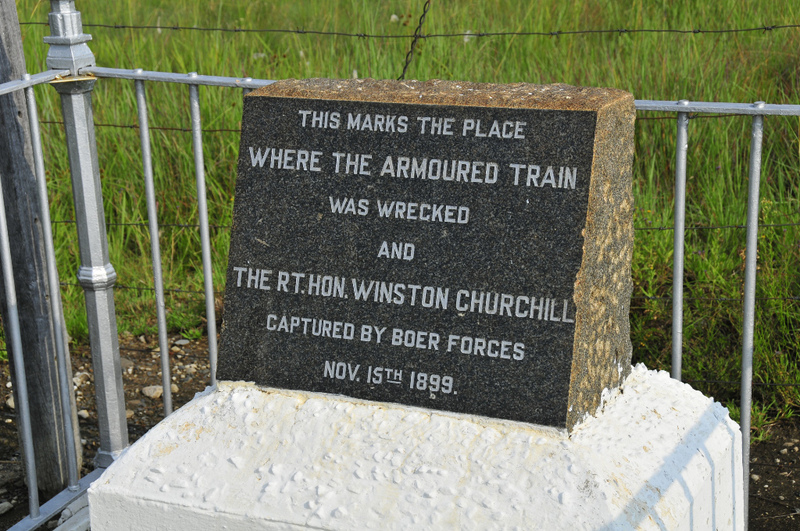 The next stop entailed a lengthy search for the site of the train derailment and capture of Winston Churchill, at the time a journalist for a London newspaper. Poor signage caused us to miss a turnoff and we drove for an hour in the wrong direction before some local people took us to the site with its not very prominent plaque on a small stone base. This was a good opportunity to take a tea break and have a look around – we discovered the train line still passes nearby when a long goods train came rumbling past. 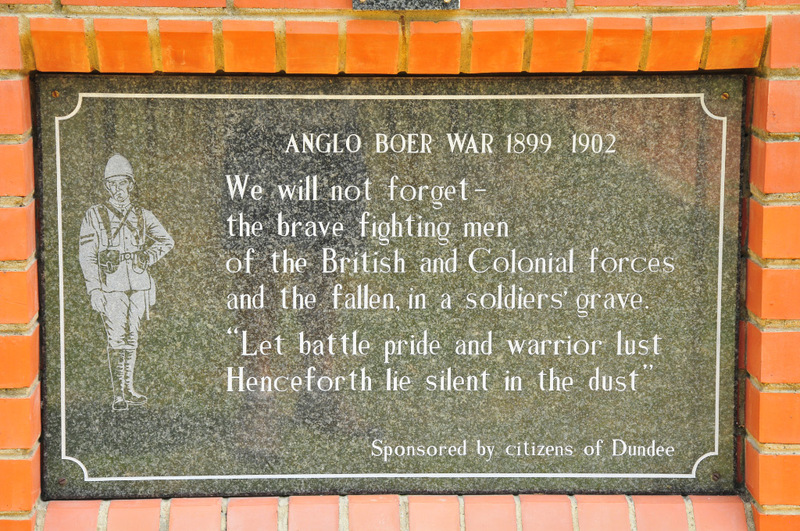 Anglo-Boer War 1899-1902. 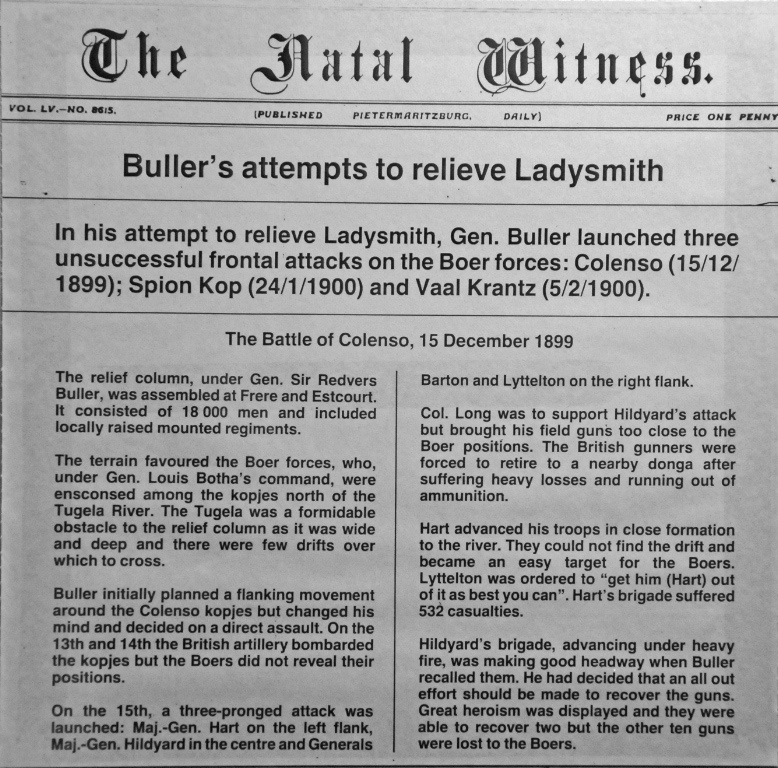 With Ladysmith under siege and Boers occupying Colenso, the British needed to know where the Boers were heading and part of their reconnaissance was done by sending an armoured train part way up the line from Estcourt to Colenso. On one of these recces Winston Churchill accompanied the soldiers on the train, being a young reporter for a London newspaper and out for adventure. 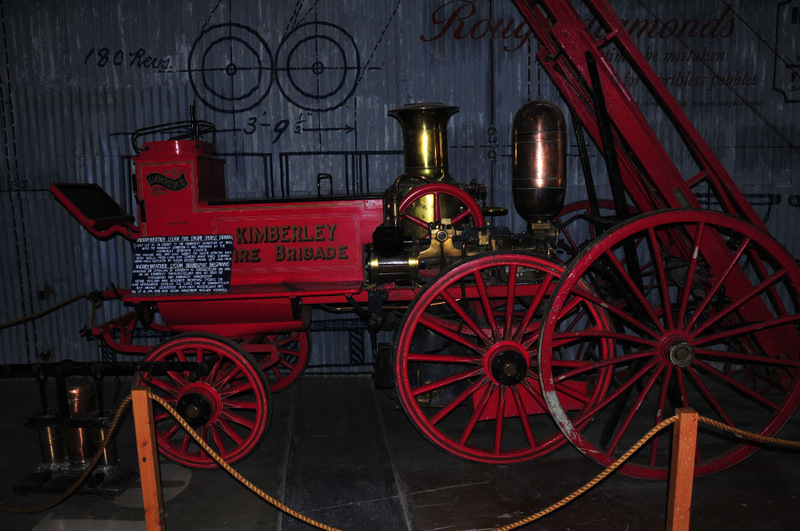 That morning the train got as far as Chievely before starting the return journey in reverse – however the Boers had spotted the train and placed rocks on the track at the bottom of a slope, then opened fire on the train as it approached, causing it to speed up to escape the fire. This resulted in the train derailing massively at the point where the rocks had been placed and fighting ensued. A number of British withdrew after getting the engine going again but Churchill was captured and taken to Pretoria, where he later planned and executed a dramatic escape to Mozambique. Birding was a side issue on this trip, limited to some snatched sightings while travelling and when investigating the battlefield sites. 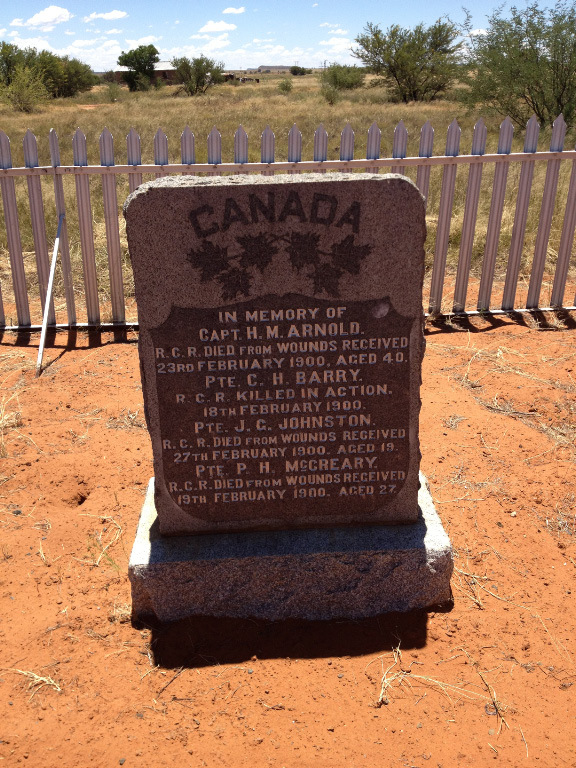 My previous Post on “Paardeberg (Finding the Canadians)” covers our trip with Sheila (Sam) and John Denner to Kimberley and the Paardeberg Battlefield. This is the follow-on to that trip. 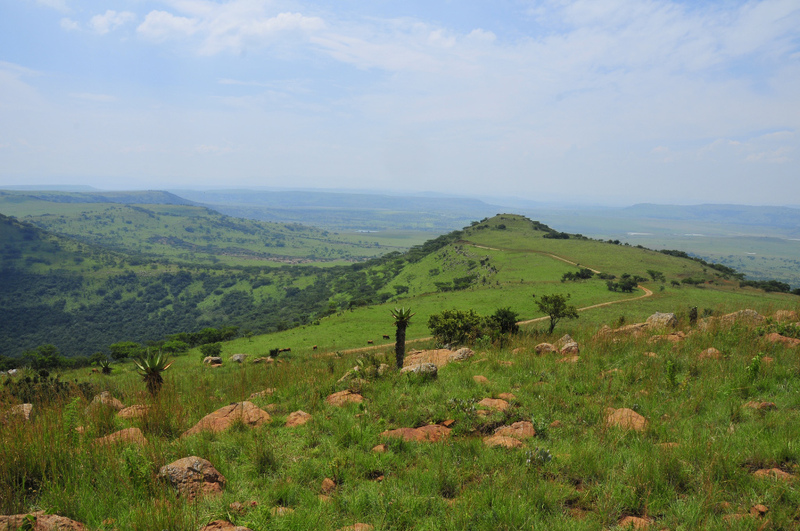 There was just a day to recover and prepare for the next leg of the trip, which was to cover a number of battlefield sites identified by John over the northern and central parts of Kwazulu-Natal province, which lies in the north-west quadrant of South Africa. 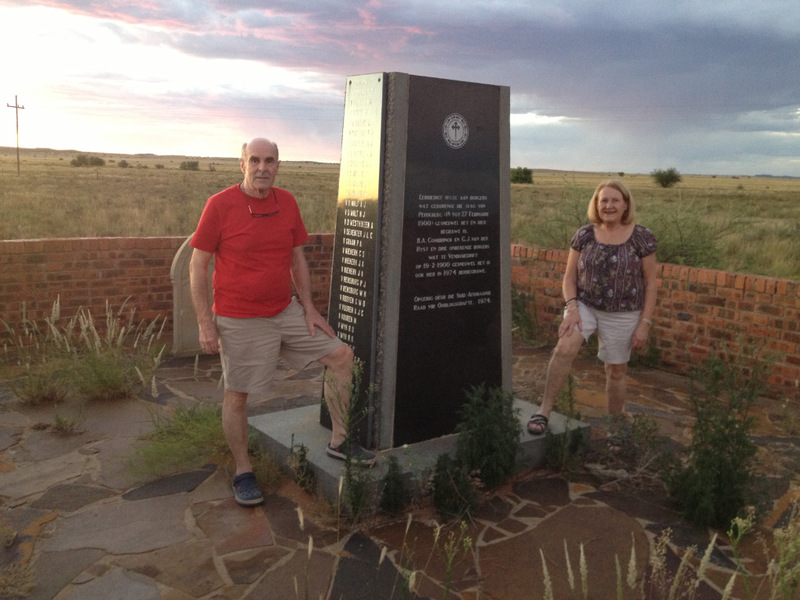 When we had discussed the visit with Pieter and Anlia Genis , family of my wife Gerda, who farm near Vryheid, they immediately offered their farm as a base for us to visit the various battlefield sites and went far beyond normal hospitality in driving us around and providing meals and a place to sleep for four days – they surely deserve a medal! Saturday 9th February 2013 : We left Pretoria by about 10h00 and drove the “back roads” via Delmas, Leandra, Standerton (where we introduced the Canadians to Spur Burgers) through to our first stop at the Majuba Battlefield site, which lies between Volksrust and Newcastle just off the N 11, with the Majuba Hill being visible from some distance away. 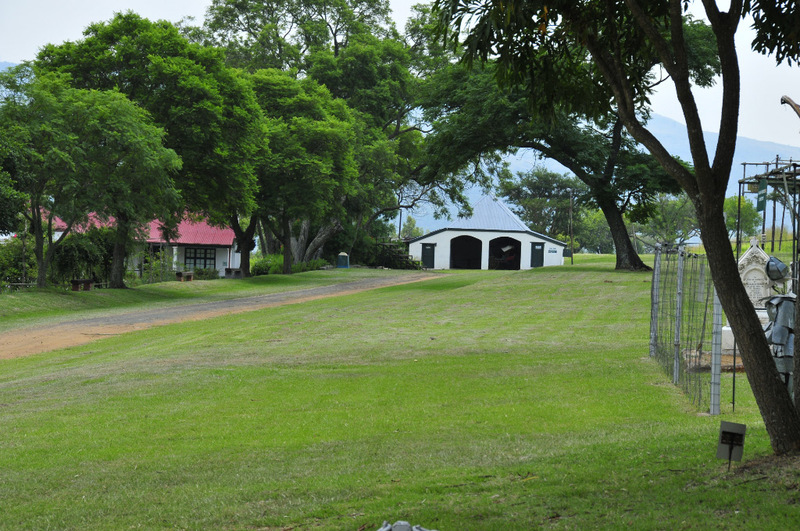 We drove in to the Commemorative Farm, wondering if it would be open for visitors and came across the caretaker, one Hendrik de Beer, who took a break from tractor-mowing the vast lawns to show us the small museum – not particularly impressive but he was quite informative and willing to tell us what he knew, in the absence of a guide. 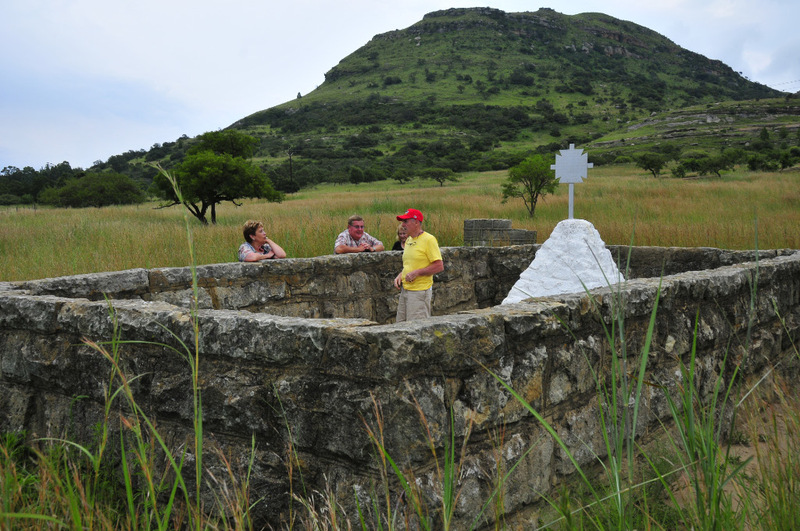 Unfortunately we did not have time to walk up the Majuba Hill, which requires 2 to 3 hours, which would no doubt have given us a better feel for the battle. First War of Independence 1880 – 1881. This was the major deciding battle of the war. 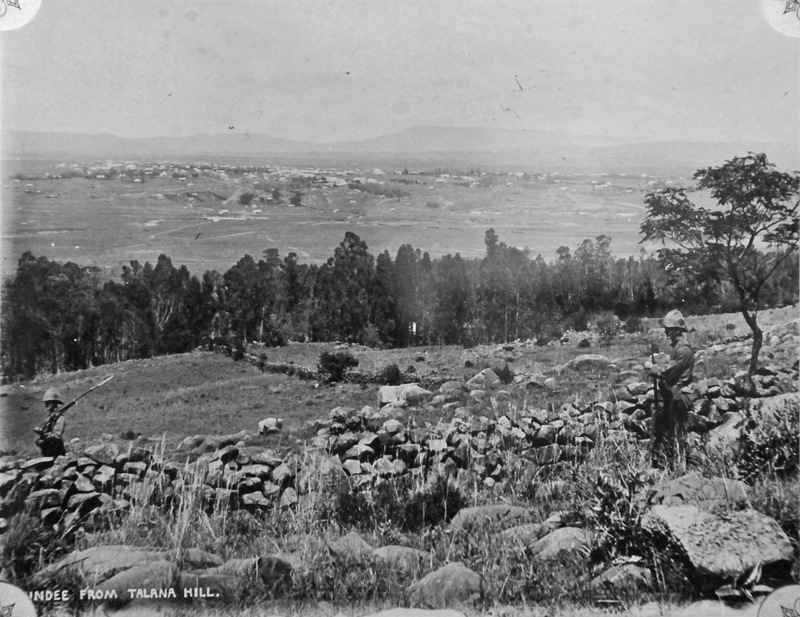 This was the second attempt by General George Colley and his troops to break through the Boer defences and enter the Transvaal. 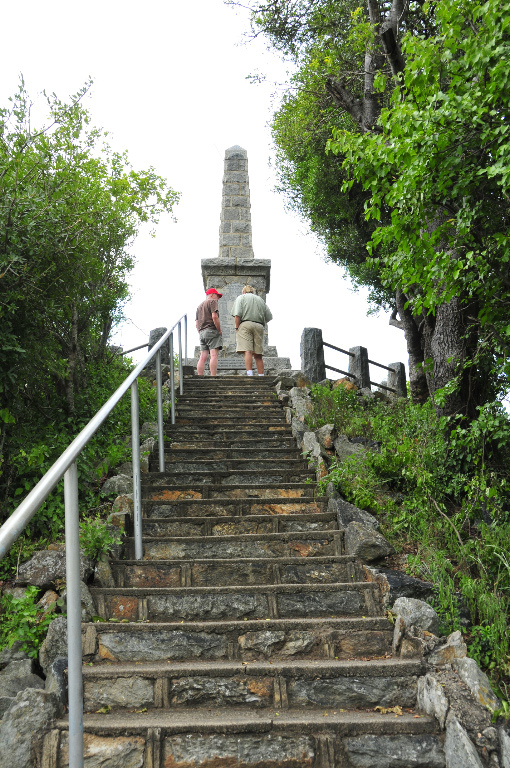 They climbed the imposing hill overnight intending to shell the Boer positions from above. 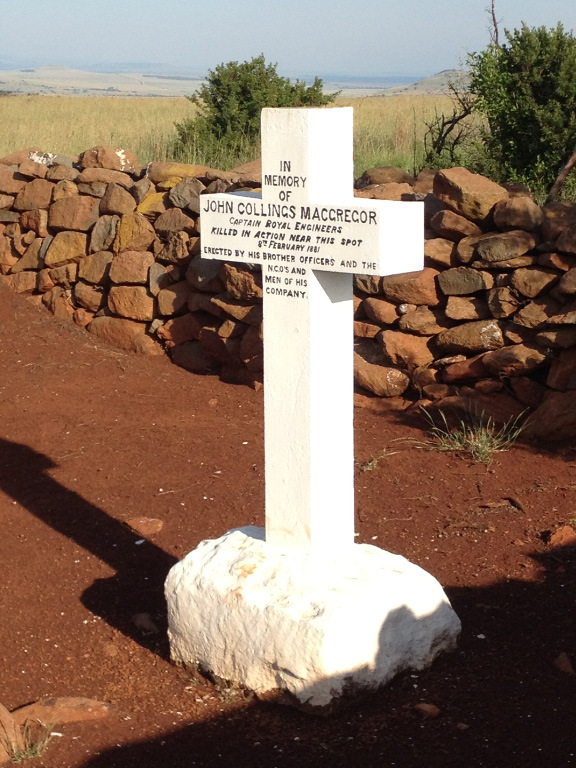 The Boers scaled the summit and eventually forced the British to flee, killing Colley in the process. 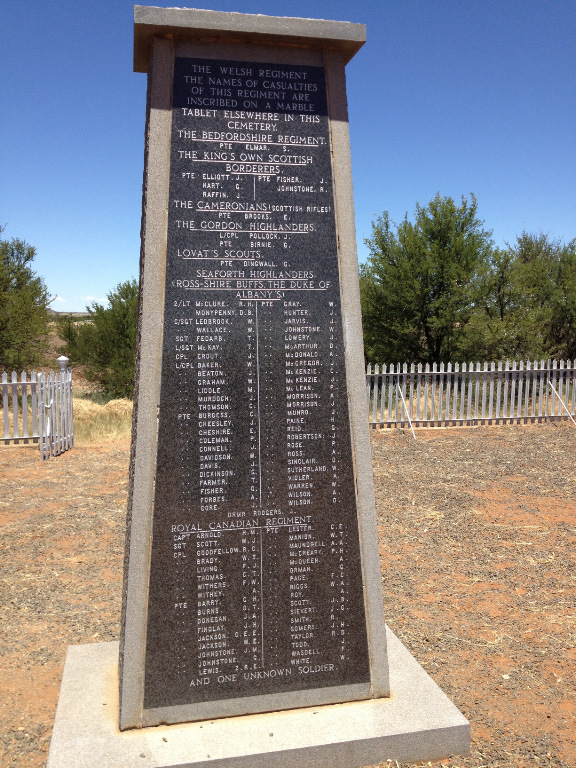 280 British men were killed, wounded or captured while the Boers lost 2 men. 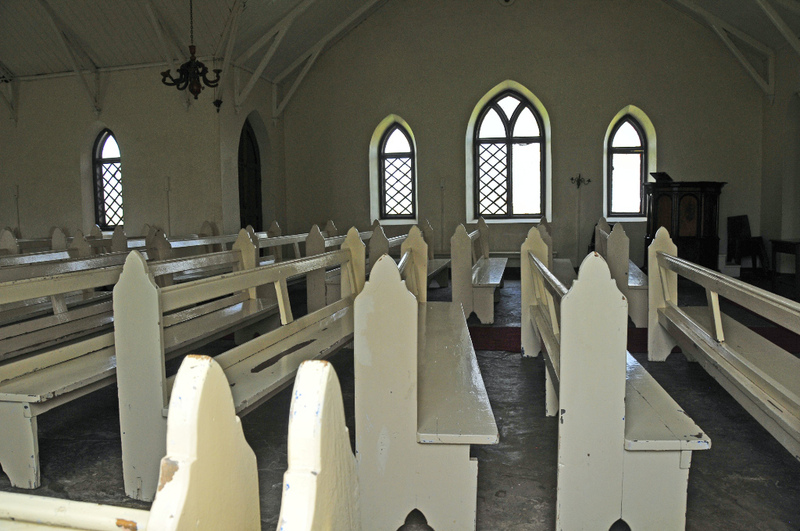 This led to the signing of a peace treaty at the nearby O’Neill’s Cottage. Signposted off the N 11 between Volksrust and Newcastle. 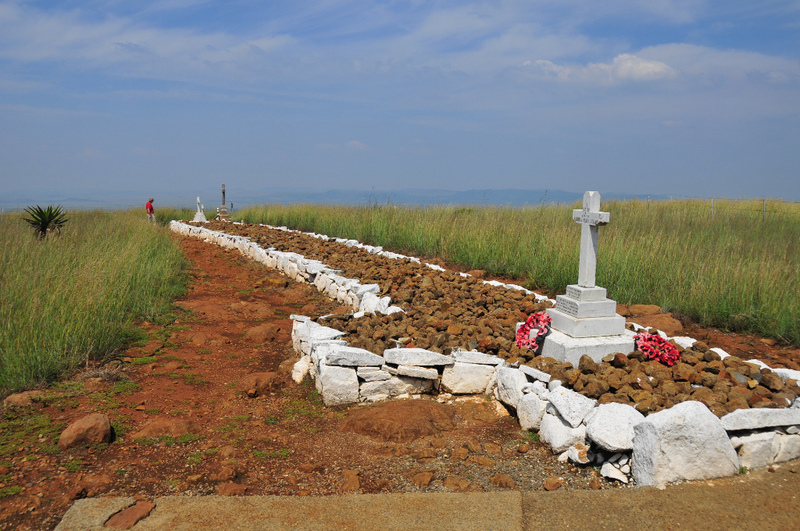 From Majuba it was a short drive to the roadside Laing’s Nek Battlefield site where we found that there was nothing at all to indicate it or the events that took place but nevertheless stopped and scouted around for a while. 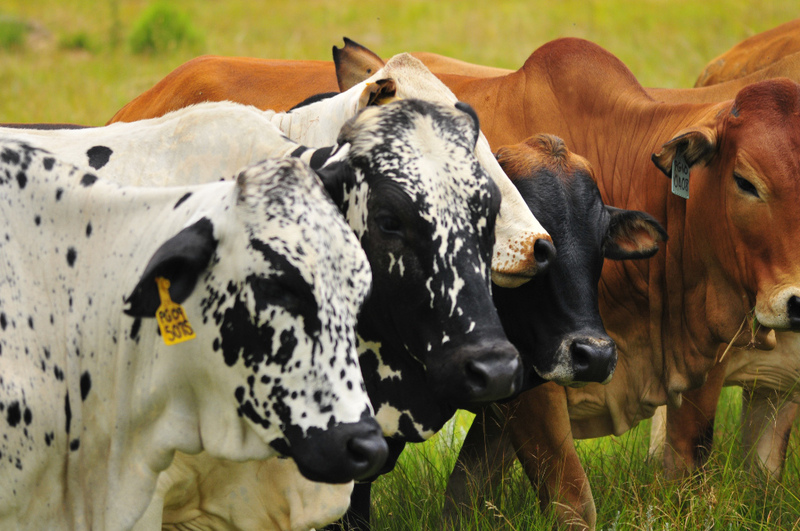 It seems best to arrange with local farm owners to access the site which is on private land. First War of Independence 1880 – 1881. 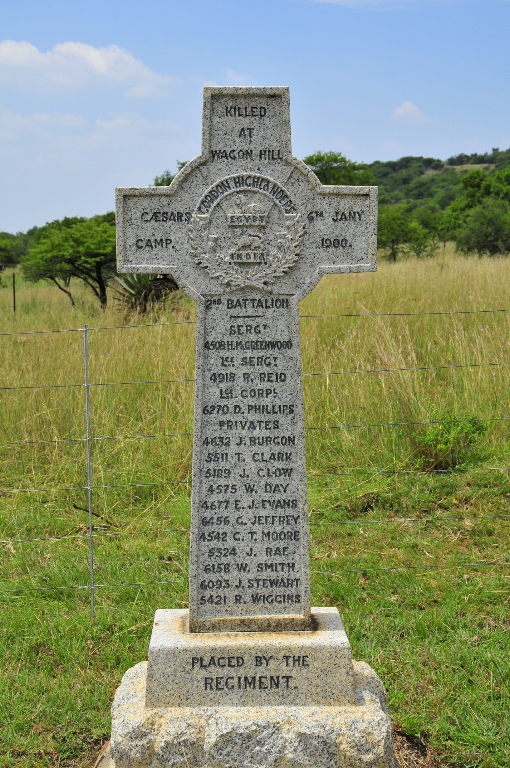 This was the first attempt by British forces under General George Colley to break through the Boer defences to the Transvaal. 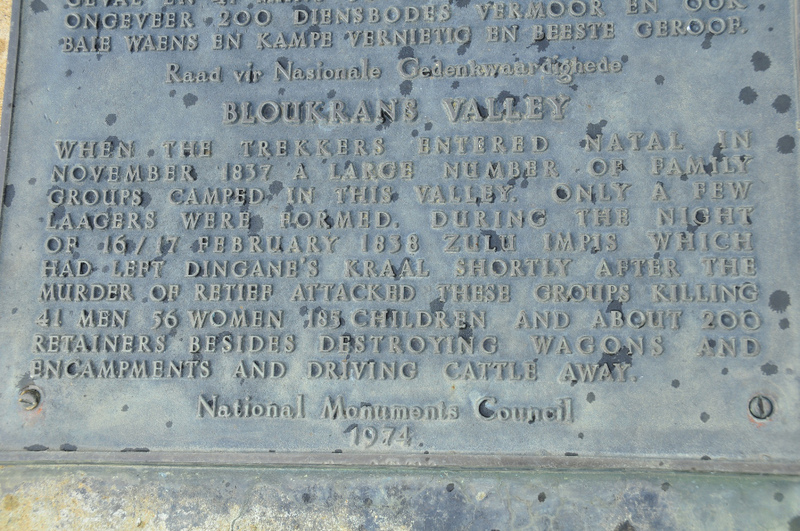 The Boers were entrenched on both sides of the road through the nek and successfully defended their position. 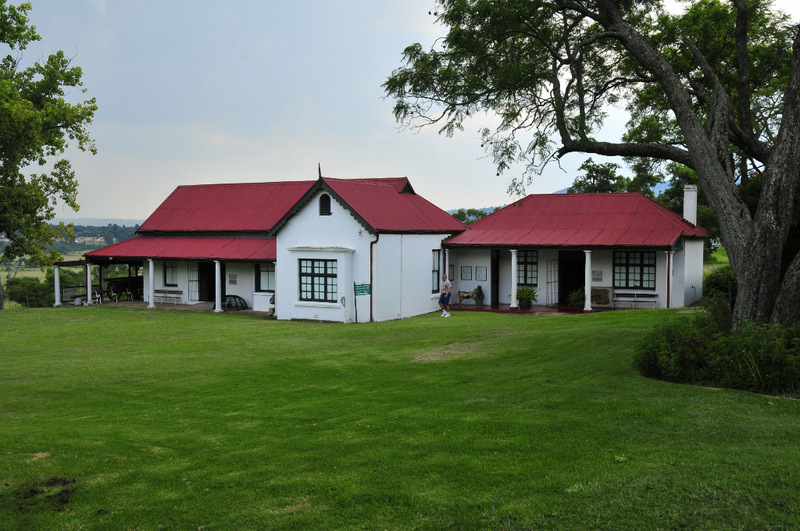 A further short drive took us to O’Neill’s Cottage which served as a hospital and was where the peace talks were held and the treaty was signed after the Battle of Majuba. 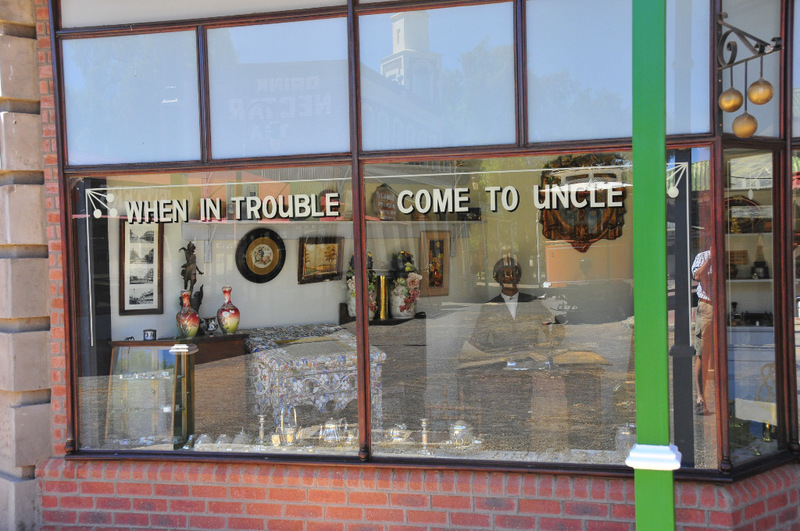 It originally belonged to Eugene O’Neill. From a distance the old house looks attractive but on closer inspection was clearly run down and had nothing at all inside – definitely an opportunity waiting, to turn it into something special which will persuade passing traffic to drive the short distance from the main road to view it. 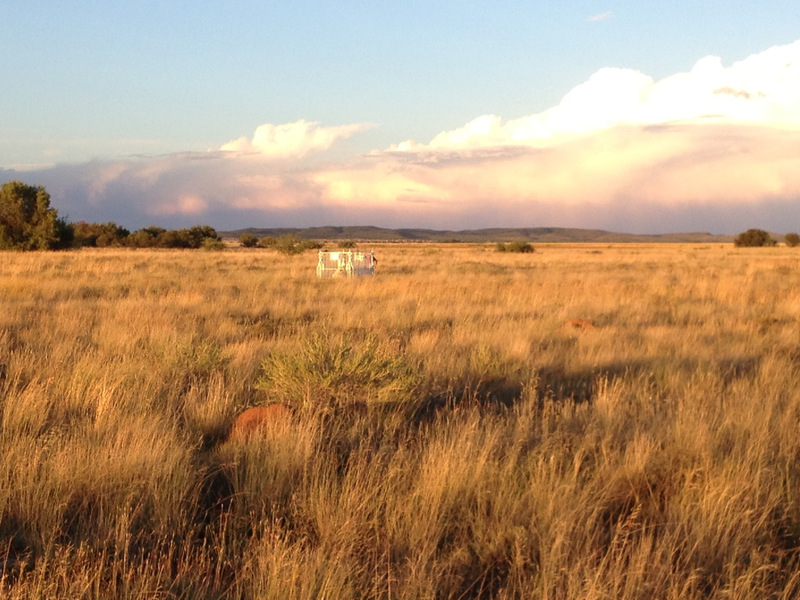 Signposted off the N11 between Volksrust and Newcastle, not long after the Majuba and Laing’s Nek sites. The rest of the day’s drive to the farm went quite slowly once we turned off the National road, due to the condition of the road and occasional “stop and go’s”; unexpectedly we saw a sign to Schuinshoogte, which was not on our agenda but, curious to see it, we took the turn-off and followed the country road for a few Km’s until we came to the cemeteries and memorials a distance from the road on both sides and spent some time exploring them in the tranquil setting of rolling hills. 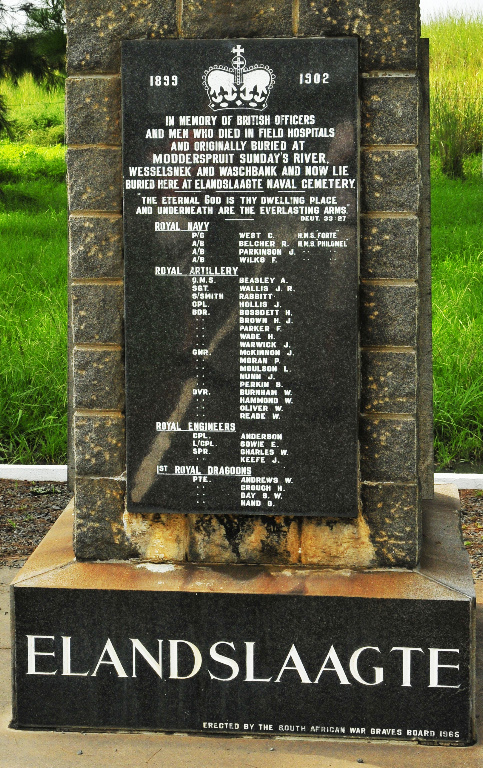 General George Colley and troops were escorting a convoy from Mount Prospect to Newcastle when they were attacked by Boer forces near the Ingogo River, on the Schuinshoogte plateau. Under siege the whole day, Colley withdrew his forces overnight. British casualties were high. Sunday 10th February 2013 : We enjoyed a bit of a lie-in and a leisurely breakfast (my favourite – krummelpap!!) before setting off for a visit to Talana Battlefield and the many-faceted museum on the site. 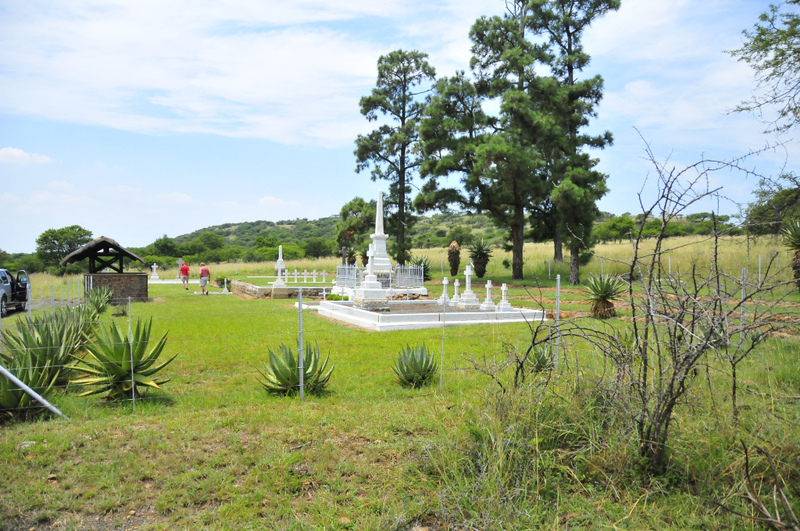 Anlia had booked us for lunch which was traditional “boerekos” (farm style food) and we spent some time afterwards checking out the exhibits, spread over the large site in various old and new buildings, as well as the gravestones marking the burial of those who died in the battle. 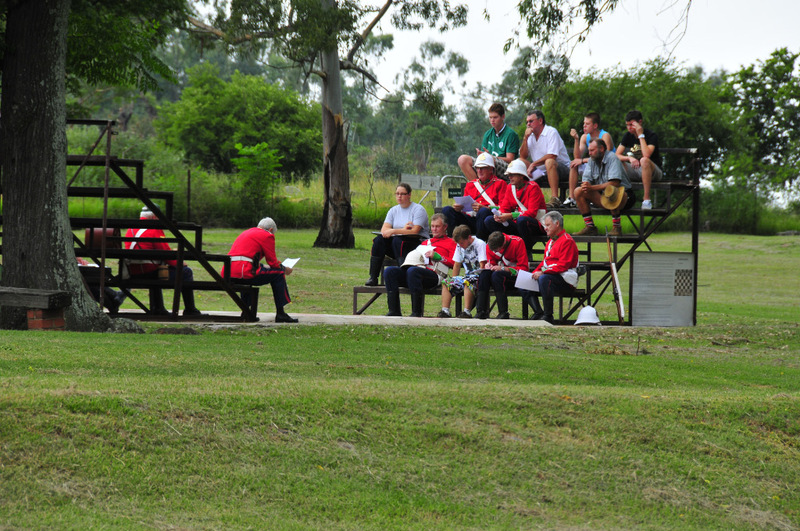 We were fascinated to see that a group of people were dressed up in the uniforms of the participants and were practising for a re-enactment of the battle – “British” in their redcoats with white strapping and the “Boers” in khaki shirts and pants. 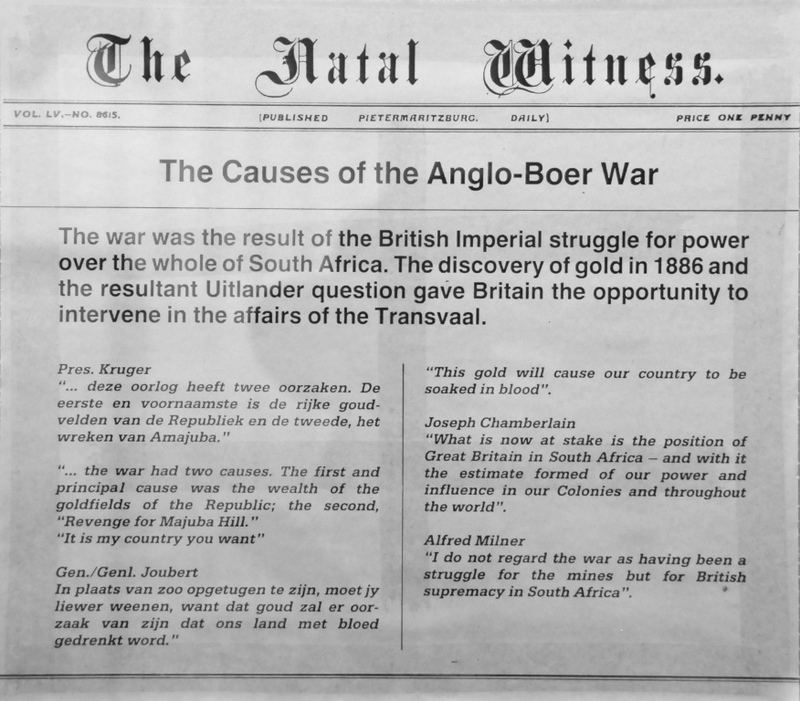 Anglo-Boer War 1899-1902. 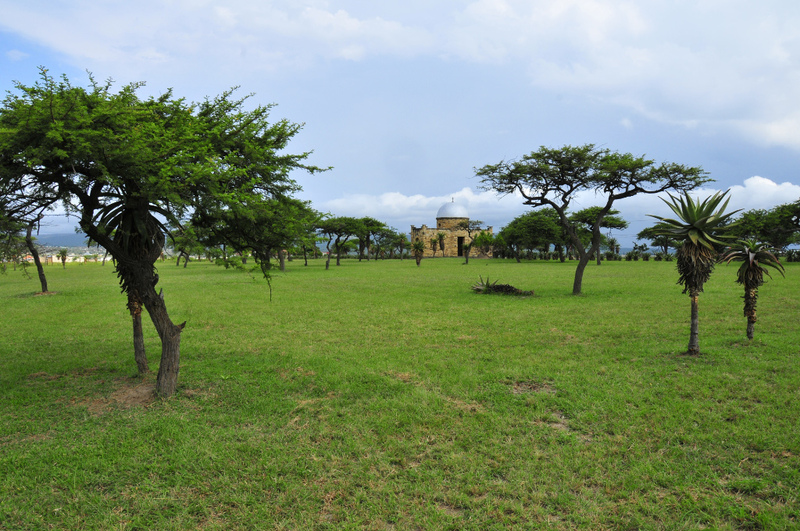 This was the scene of the first battle of the war, following the expiry of the Boer ultimatum to the British on 12 October 1899, also the first time the British forces wore khaki uniforms. 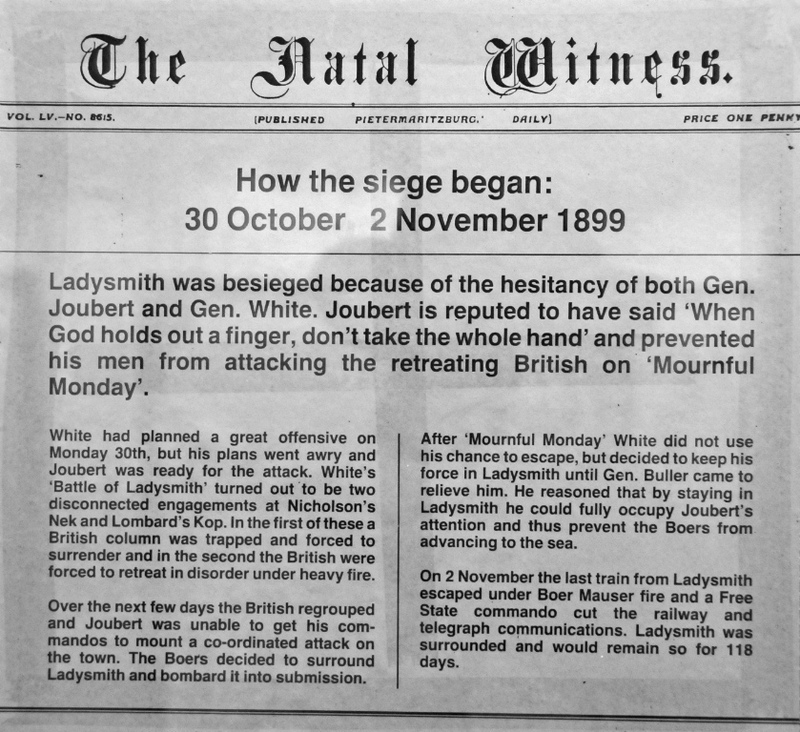 The Boers attacked the garrison at Dundee and succeeded in occupying the town while the British garrison withdrew to join the troops in Ladysmith, which shortly thereafter came under siege by the Boers for 118 days. 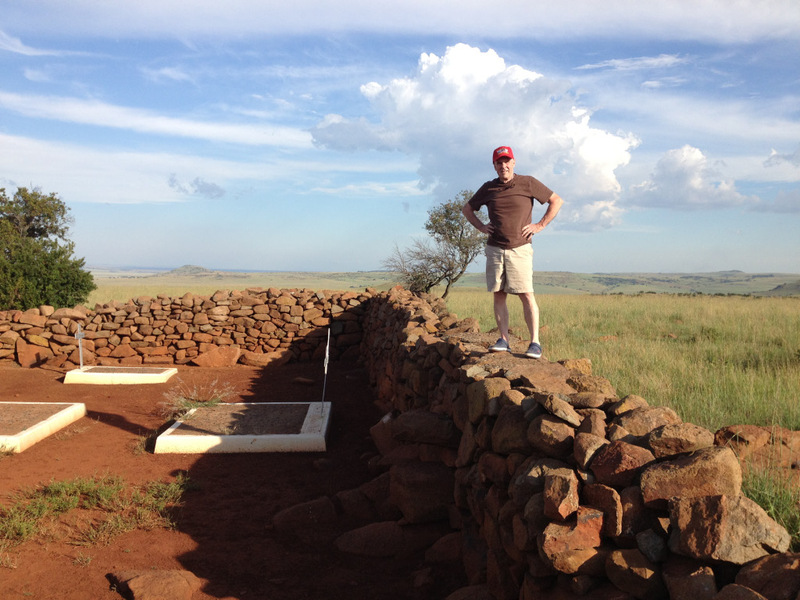 Then we moved on to the Blood River Battlefield for a look at the famous site of the battle between Boer and Zulu, which has such significance for the Afrikaners – the friendly caretaker showed us around and had us watch the short film of the background to and events of 16 December 1838, which was quite moving. 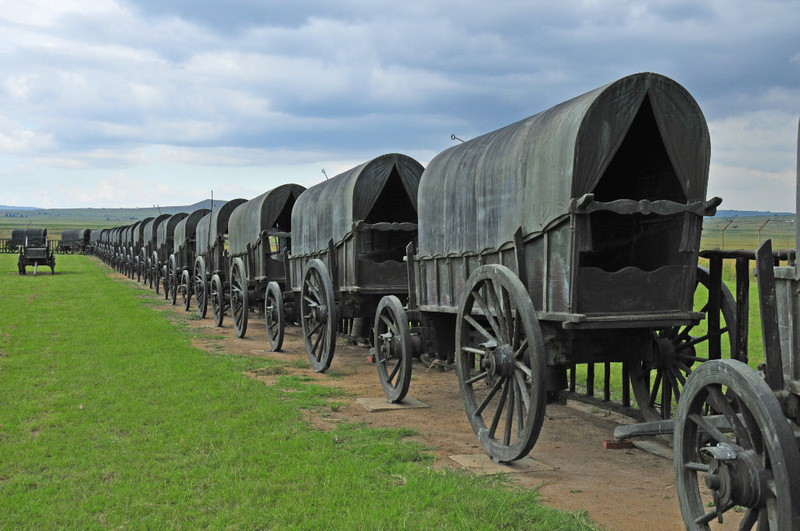 We walked down to the laager of bronze wagons a short distance away and enjoyed a picnic tea while imagining the traumatic events of that day. Later, on the way out, we took the road to the “other side” of the river where a new Zulu commemorative complex has been built. Interesting to see a somewhat different take on the battle. 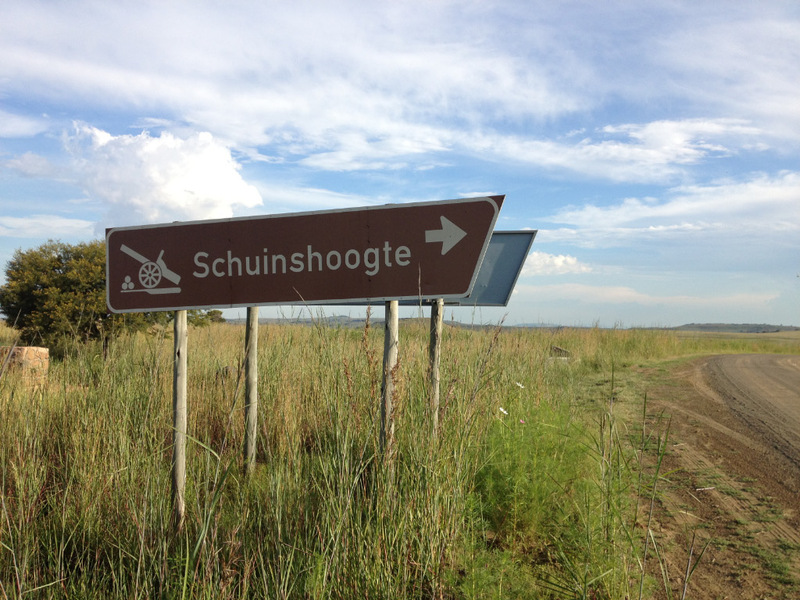 Signposted about 20 Km from Dundee on the R 33 to Vryheid. 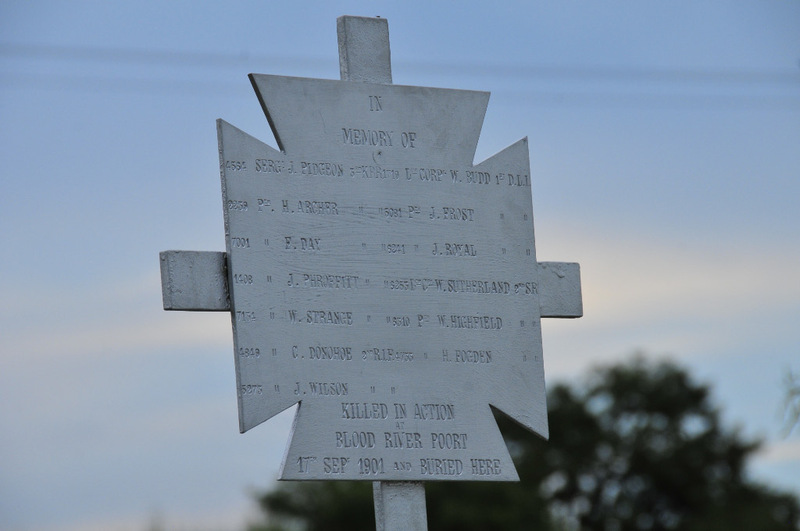 The British forces based at Dundee engaged a large Boer Commando at Blood River Poort, but were outflanked by the Boers and forced to surrender. 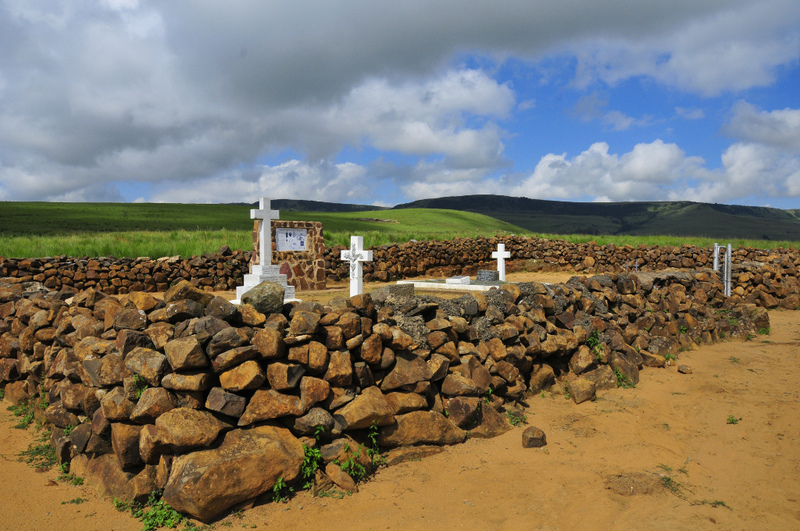 Off the R 34 to Utrecht – 5 Km from the junction with the R 33, turn right onto a secondary gravel road and after another 8 Km turn left at the sign to Goedekloof farm – about 1 Km further lies the cluster of graves. 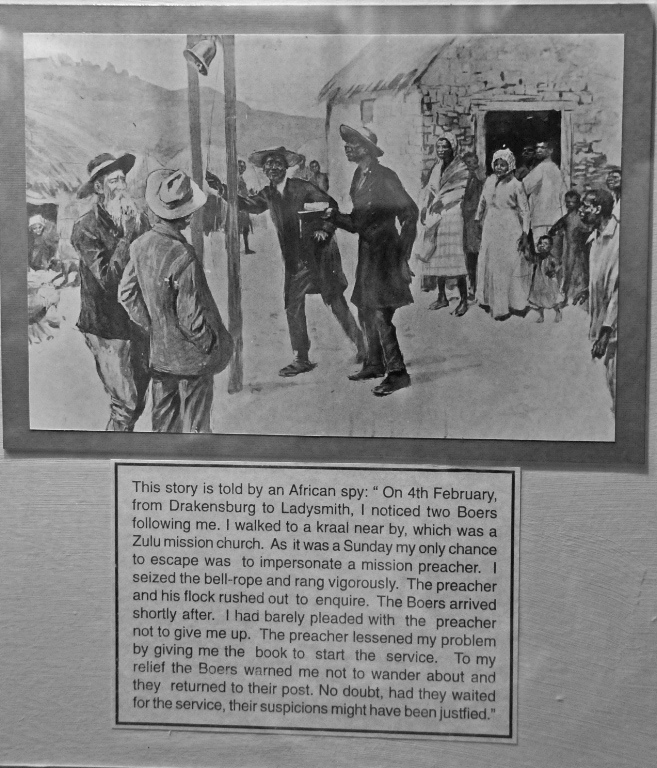 Growing up in South Africa in the second half of the 20th century, I was aware, mainly through history lessons at school, of the conflicts that took place between the Boers and the British forces in the latter part of the 19th century and the battles fought between both of them and the Zulus which preceded those conflicts. 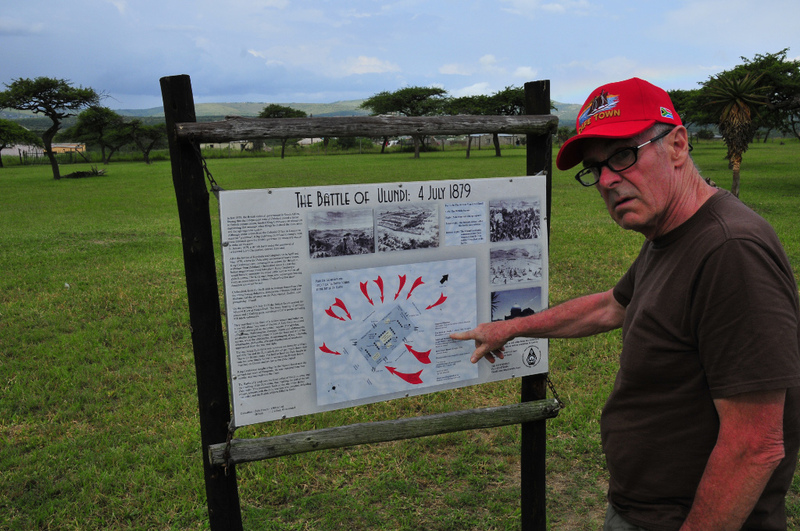 However it never got beyond history lessons until we heard that John and Sam Denner were planning a 4 week visit to South Africa in February 2013, and that John in particular was very keen to visit as many of the battlefield sites as possible. 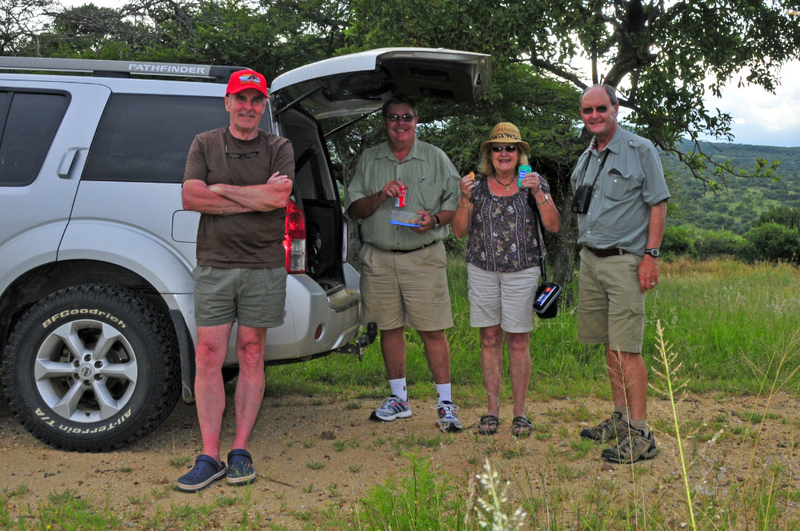 Now, my sister Sam, or Sheila as we know her, has lived in Canada for 4 decades or so, but had visited us a few times in the intervening period – however we had never met John, our brother-in-law, although he did spend a year in SA in his 20’s. We were aware of John’s passion for all things related to military events and the fact that he runs a business from their home in Canada trading in war memorabilia, weapons, uniforms and the like. What we came to realise as our tour of the battlefields progressed, is that his knowledge of the battles that took place in the 19th century is extensive and he often proved to be more knowledgeable than some of the local people we came across. 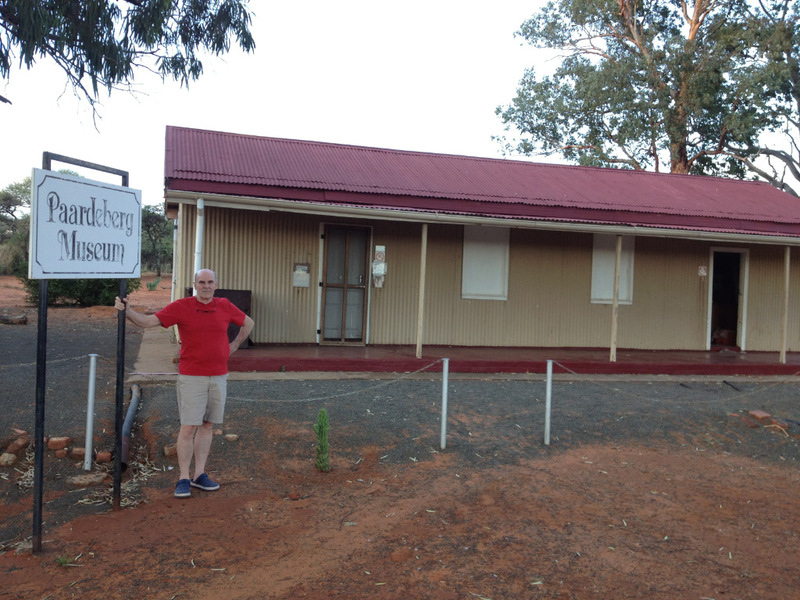 John sent a list of the sites they most wanted to visit and, because many of them were just names to me, it took some research via Google to establish locations, confirm travel routes and look at accommodation options. Between Sam and I we drafted an itinerary which allowed for visits to selected battlefields of the Northern Cape and Kwazulu-Natal, followed by a few days in Kruger Park and touring Mpumulanga, after which we would fly to George to spend some time in Mossel Bay and the Garden Route, then a brief visit to Cape Town before returning to Pretoria. A few days were set aside to show them Pretoria and Johannesburg and to spend some leisure time in between the main parts of the tour. I had decided to take the time off myself and see some parts of the country that we had not experienced ourselves – and of course there would hopefully be a chance to do a bit of birding along with the other activities. 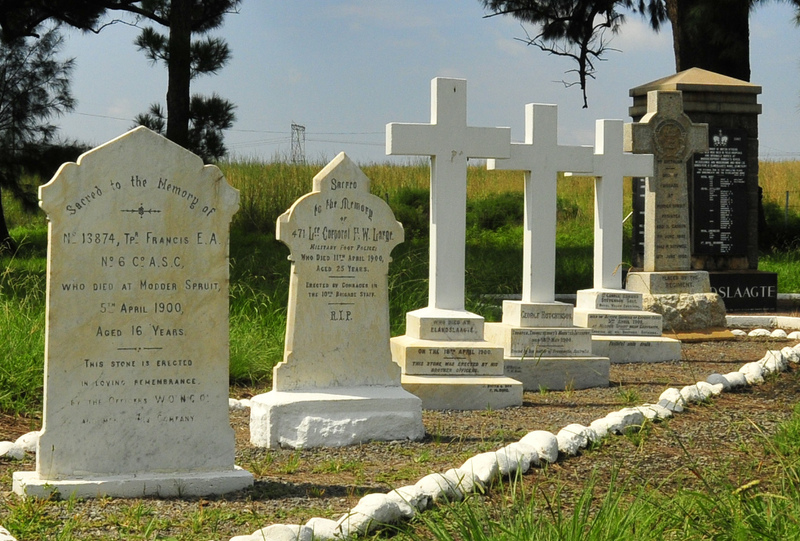 The research I did on the battlefields had already pricked my interest to the extent that I was really looking forward to finding out more about the often turbulent history of South Africa. John and Sam (Sheila) arrived on Tuesday 5th February 2013 on the early BA flight and we were at our home in Wapadrand, Pretoria by 9 am. 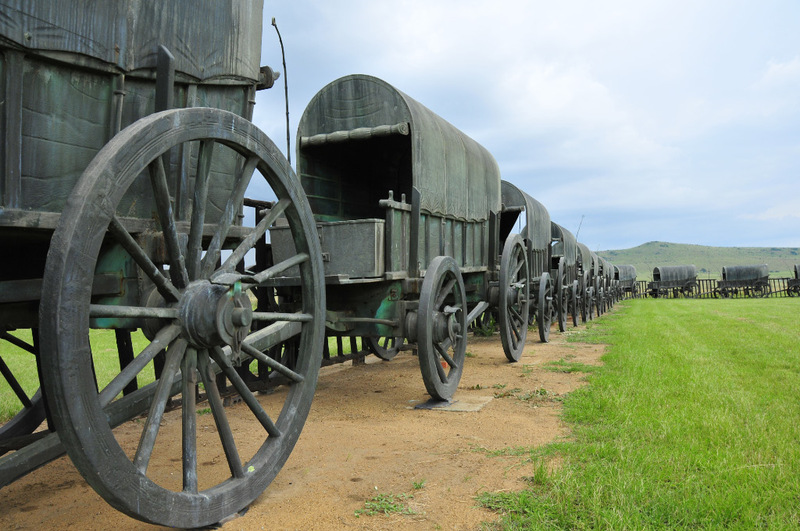 After settling in and catching up a little, we decided to get “warmed up” for the touring ahead by taking a drive through Pretoria with stops at the historic Union Buildings and the Voortrekker Monument. We could already see where their interests lay as John checked out the cannons at the Union Buildings and Sam enjoyed the curios on sale, with all of us admiring the good views over Pretoria. 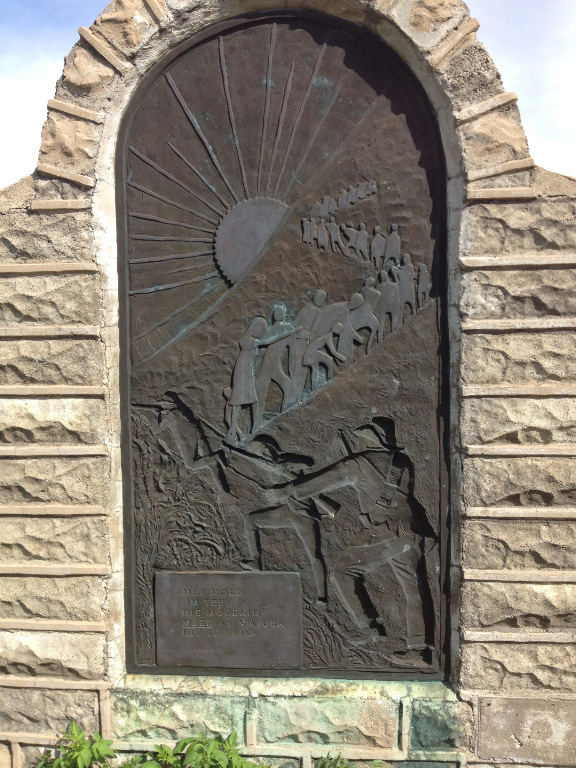 The Voortrekker Monument was really worthwhile visiting, with its special aura and amazing carved reliefs – even the museum downstairs was full of interesting artifacts from the Great Trek era and it was immediately clear that John in particular has an affinity for the Boers and relates strongly to their ideals. 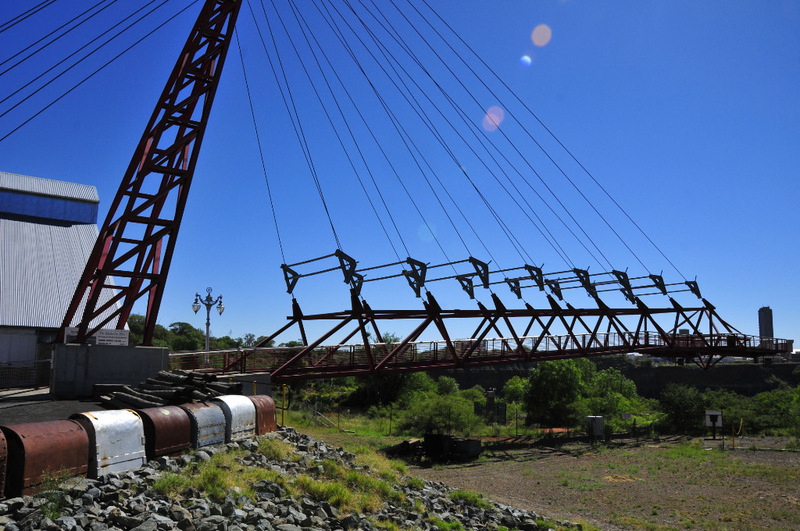 We set off for Kimberley in the Northern Cape around 9 am on the following day, with a journey of some 650 Km ahead of us, taking the route via Krugersdorp, which we bypassed on the back roads, Carletonville, Potchefstroom, Klerksdorp and Bloemhof. It was a long drive with a couple of comfort stops, a stop for Steers Burgers in Bloemhof and a brief “look-in” at our son Stephan’s house on the outskirts of Potchefstroom to say hello to Liesl and the 2 kids, Jocelyn and Christopher. The landscape changed from built-up Gauteng to the wide open landscape of the Northern Cape, with steps in between and eventually Kimberley appeared on the horizon at about 5 pm that afternoon – it was a quick decision to head out to Paardeberg museum and battlefield in order to recce before tomorrow’s planned visit, despite thinking that it would be closed at this time of the day. 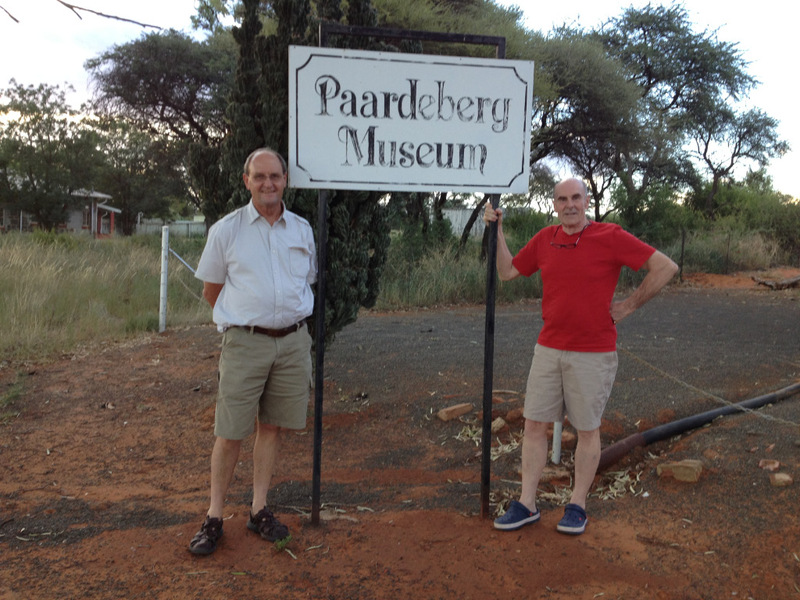 Having found the Battle of Paardeberg site on Google Earth the previous day, we knew to head out on the N8 Bloemfontein road south-east of Kimberley for 44 Km and found the little museum without too much difficulty a couple of Kms off the main road near the “Perdeberg” station – the different spelling of “Paardeberg” almost put us off, but fortunately we followed our instincts. 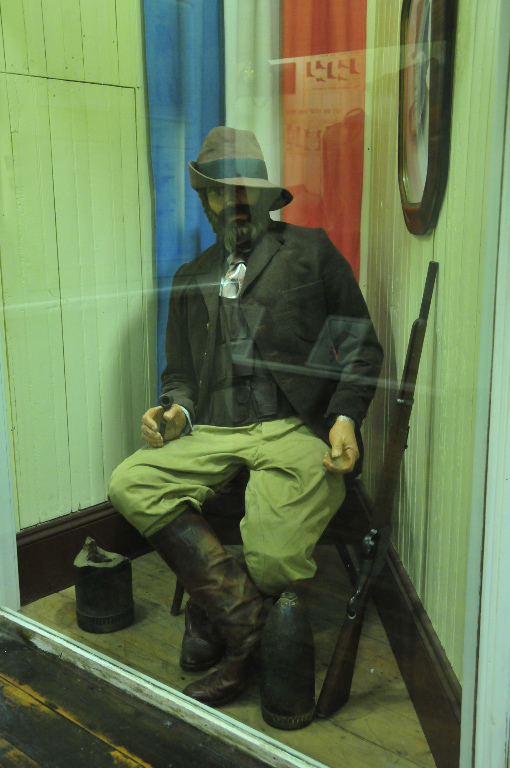 Amazingly, we found the caretaker sitting outside the locked museum, despite it officially having “closed” an hour and a half before we arrived and, as if by magic, a local lady assistant appeared out of the bushes with a key to open the museum specially for us. From the visitor’s book entries it was clear that not many people visit this charming museum, which made us even more appreciative of having found the caretaker at his post. We spent the next half hour going through the exhibits which set out quite nicely the background and events leading up to the battle and the battle itself. From the museum we took the gravel road to where we had been told the battlefield sites were and after about 7 Kms we found the first monument/grave site just off the road in the middle of a field, which by now was bathed in late afternoon sunlight which lent a beautiful glow to the long, dry grass. 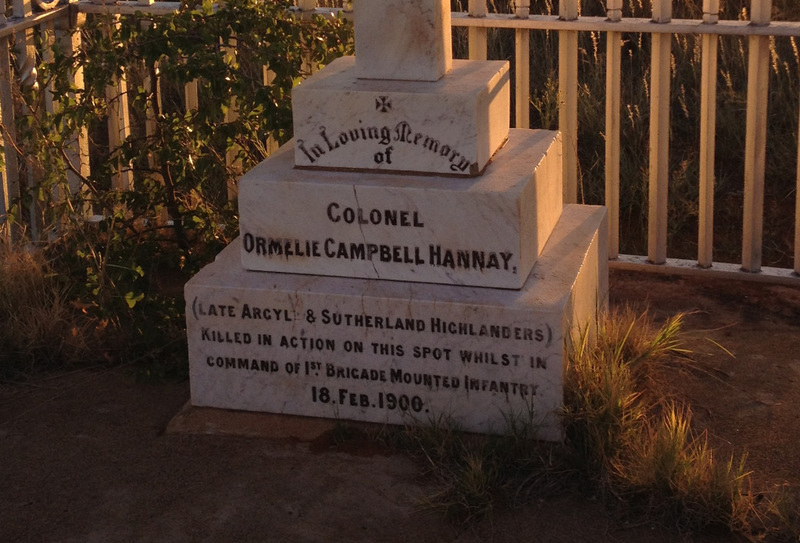 We discovered it was the grave of Colonel Hannay, who led a suicidal charge on the Boer encampment and died at that very spot. 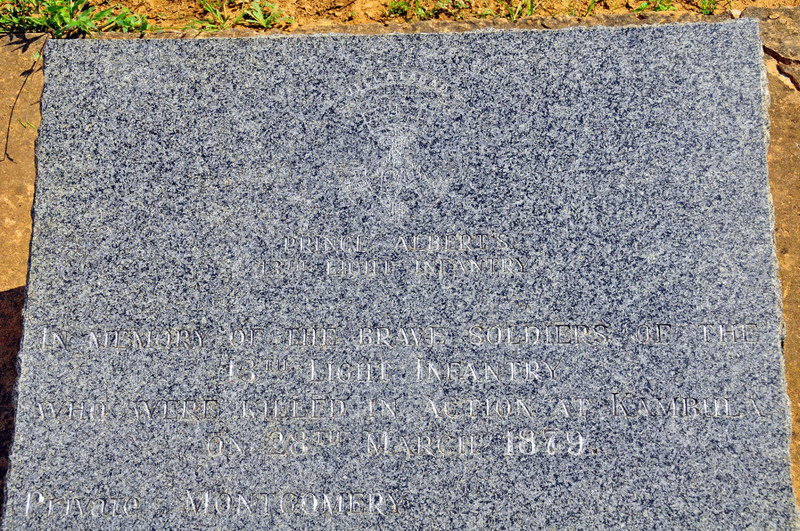 This was to be the only war grave we visited that was for an individual – all of the others at Paardeberg and the other sites we visited later in Kwazulu-Natal were multiple war graves. 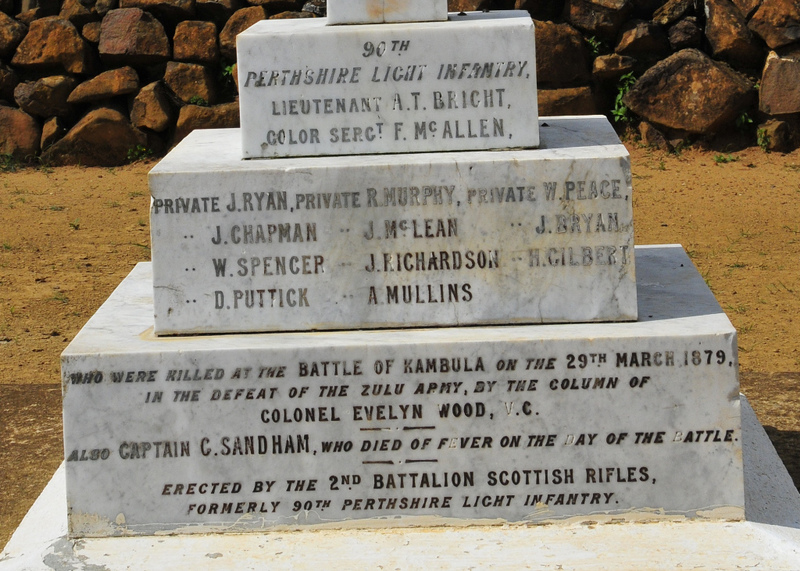 It was also the first poignant reminder of the sacrifices made by young men on both sides, but particularly those in a strange land so far from their family. 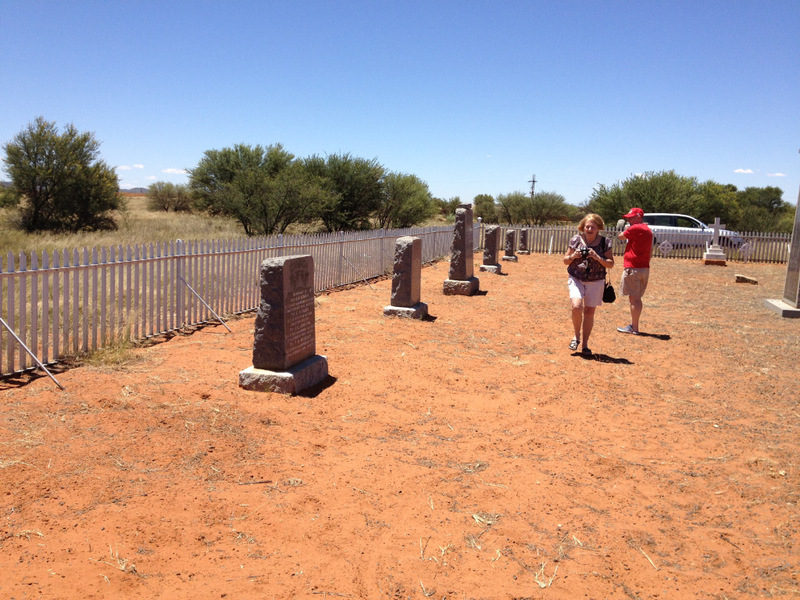 Travelling further along the road, with the sun starting to dip towards the horizon, we were on the verge of calling it a day, when we saw a further site with a number of graves and stopped to investigate – it turned out to be the site of a monument to the Burgers (Boers) who had died at Paardeberg. 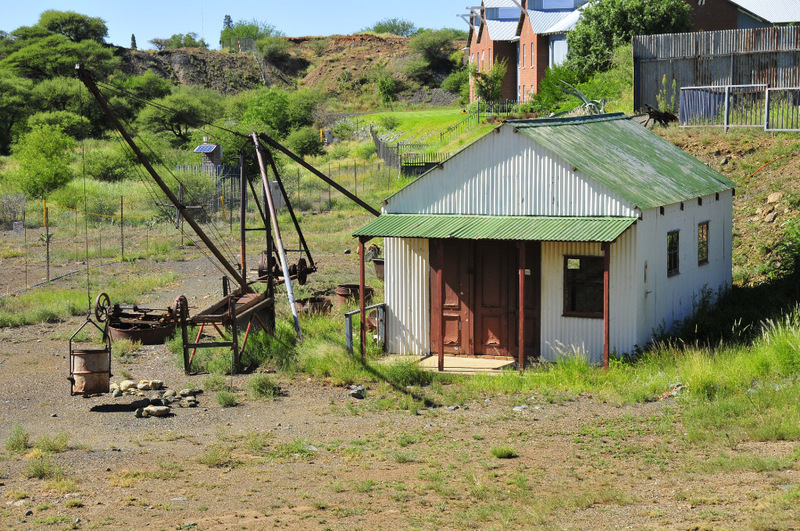 While we were stopped, a local farmer who introduced himself as “SF” Marais, turned up in his bakkie (pickup) and in broken English and his home language of Afrikaans told us a bit about the area and that his family had farmed the area for more than 100 years. He gave us directions to some of the other sites where the “Engelse” (the British forces) were buried on the other side of the Modder River, which we thought would be good place to visit the next day. 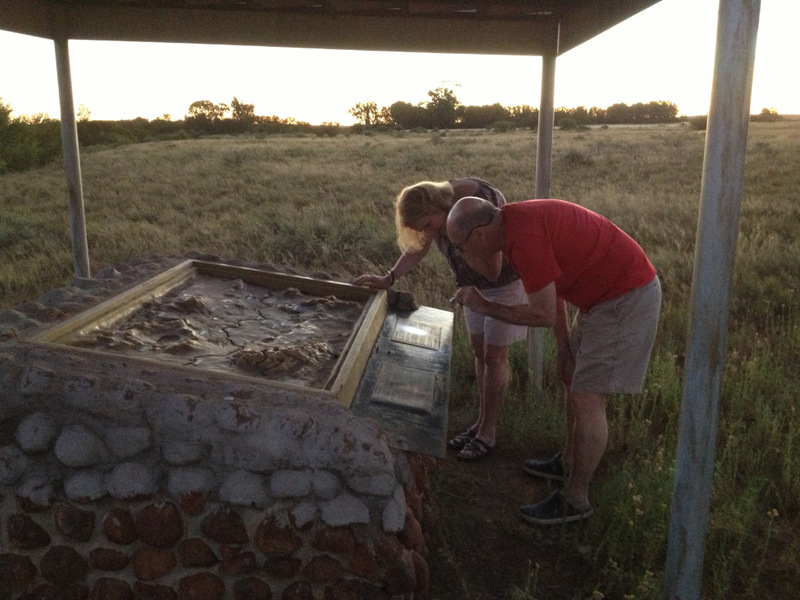 By now it was close to dark and we ended up investigating the Paardeberg battle site with a torch, after which we headed back to Kimberley for a late check-in at the Cecil John Rhodes guest house – the managers had tired of waiting for us so we had to wait for them to return and open up. After a decent meal at Mario’s across the road we collapsed into bed. 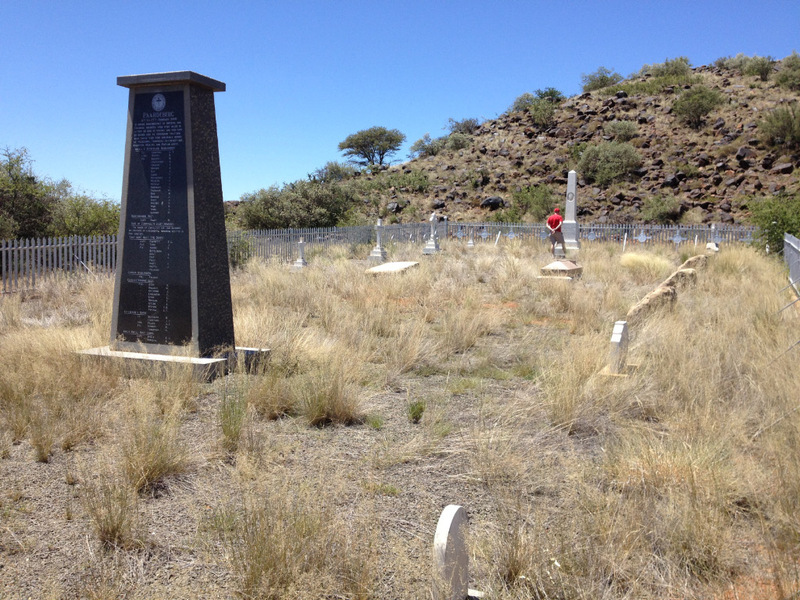 After spending some time in the recreated village adjoining the famous Big Hole of Kimberley, we headed back to Paardeberg with the main mission of finding what John had come for – the graves of the Canadian soldiers who died in the battle. After spending some time on the southern side of the Modder River where we found a large grave site but no sign of the Canadians, we found our way back to the northern side of the river where we had been the previous evening and carried on in the direction that SF Marais had said more of the “Engelse” were buried. It was with much excitement that we found the site at the last brown “Cannon” sign, indicating a battlefield site, and discovered that the Canadian soldiers had been buried there. John and Sam and indeed myself, were thrilled to find what they had come such a long way to see, while at the same time feeling sad for the losses incurred on both sides. Excited by our find, which had proved to be challenging on these back roads and with very little signage to guide us, we proceeded to Bloemfontein and back to Pretoria via Ventersburg, Kroonstad and Johannesburg, eventually arriving at 7.30 pm, having travelled some 1400 Kms in the 2 days. Mission accomplished! 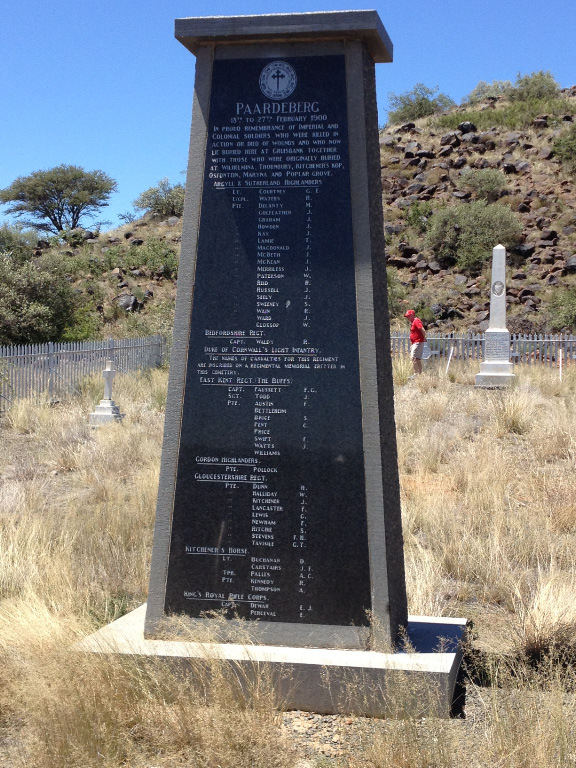 The Battle of Paardeberg began on 17 February 1900 and was to become the longest and biggest battle of the Anglo-Boer War (1899-1902), ending with the Boers under General Piet Cronje surrendering on 27 February 1900. 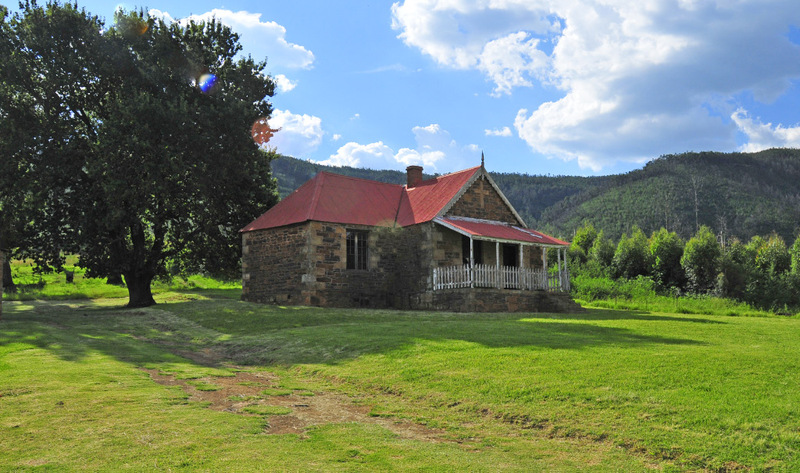 The British forces under command of Lord Kitchener surrounded the Boers at Paardeberg – the next morning Lord Roberts took charge to continue with the battle. 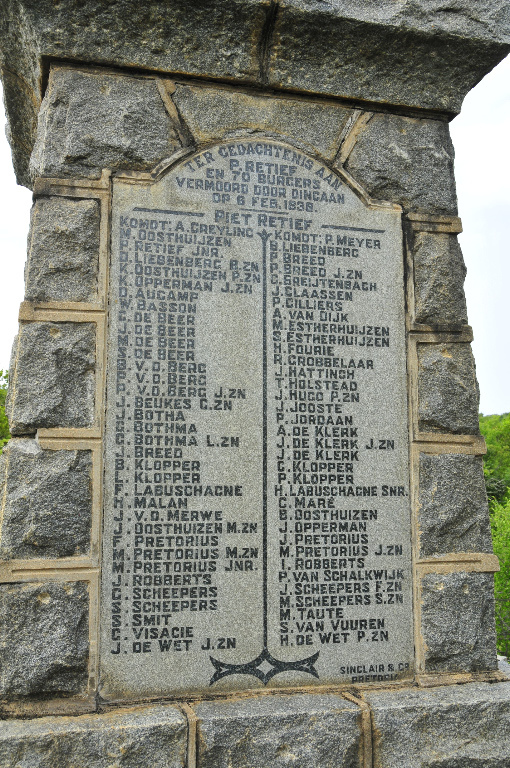 The Boer forces lost 100 men, 250 were wounded and 4096 captured. British forces lost 258 men with 1211 wounded and 86 taken prisoner. 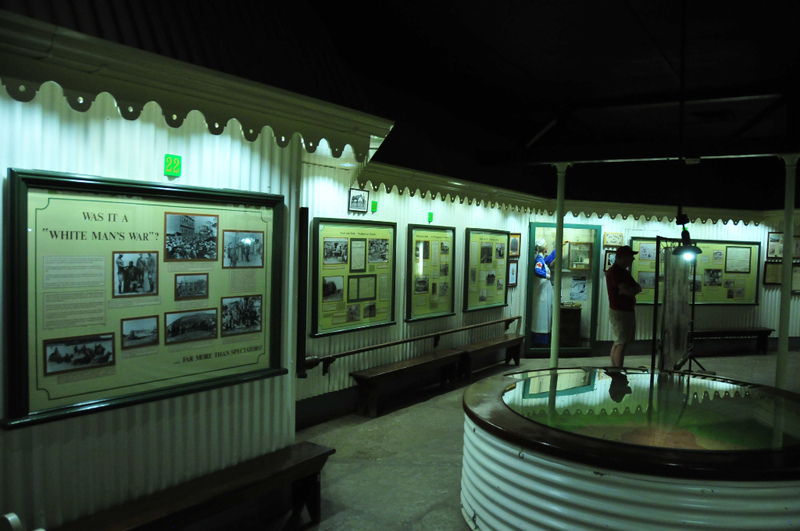 This is one of the more difficult sites to find but it’s best to visit the little museum first and then ask directions from there. 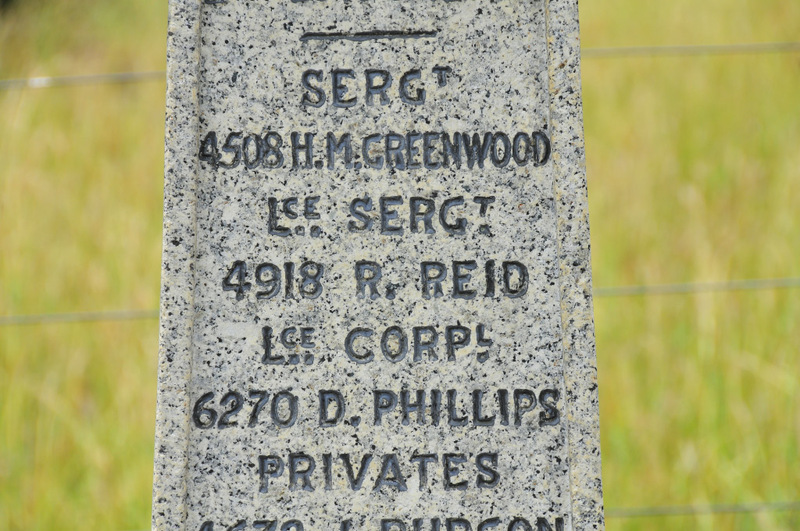 The museum is at 28° 59′ 1″ S / 25° 4′ 48″ E and the battlefield and grave sites are mostly along the same gravel road heading east – just don’t give up too soon, as you have to travel quite a few Kms before you come across the sign to where the Canadians are buried. 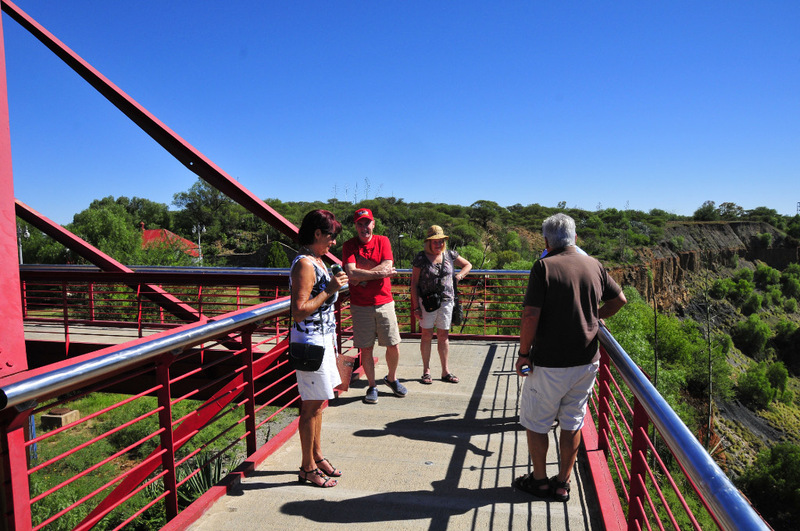 To get to the southern side of the battlefield, return to the N8, head towards Bloemfontein and just after the bridge over the Modder river, turn left and follow the gravel road, keeping a look out for the sites, some of which are signposted. 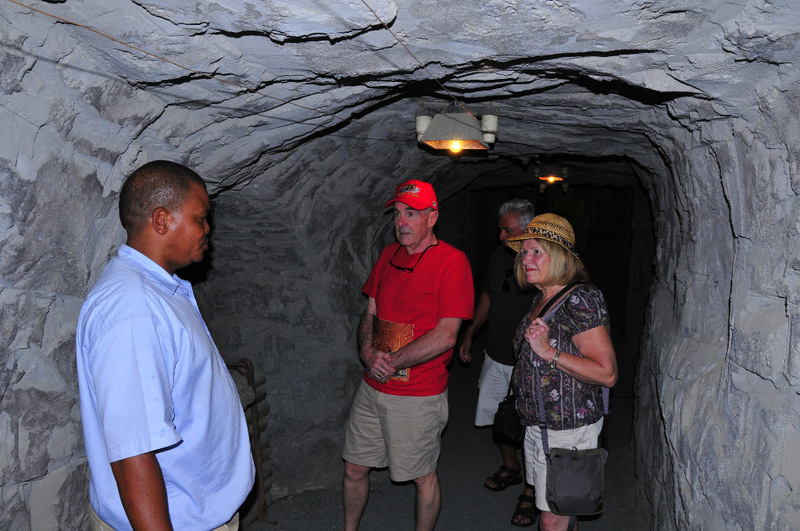 During our quick visit we managed to fit in a visit to the “Big Hole” museum complex, where we were fortunate to just catch the 9 am tour. 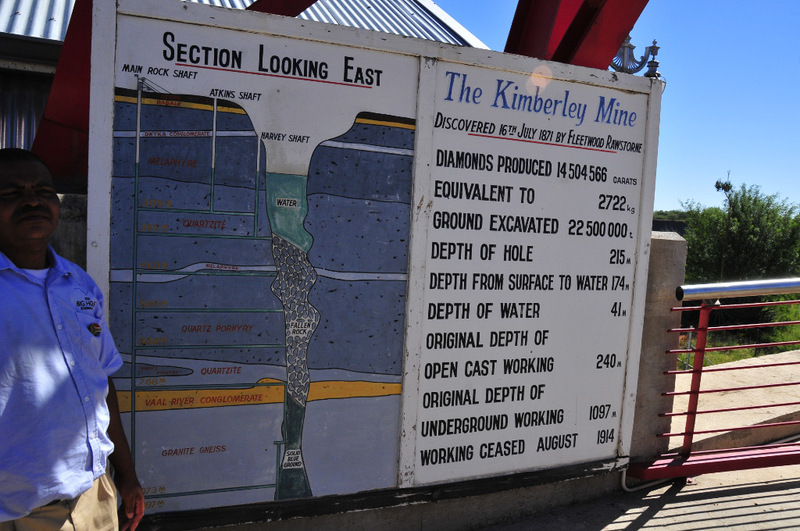 The guide took us to the auditorium for an excellent film introduction to the history of the Big Hole, then out onto the viewing deck overlooking the gigantic hole and finally “down” the mine shaft to a reproduction of the original mine workings. Out on the deck I looked for Bradfield’s Swifts which are known to frequent the hole and found a couple fairly easily among the Alpine and Little Swifts, which seemingly also use the open air above the big hole for feeding on small flying insects. Birding was a side issue on this trip, limited to some snatched sightings while travelling and when investigating the battlefield sites. A couple of short ad hoc pentad lists were submitted, which included a Familiar Chat (being a new species on the one list) and a handsome Pale Chanting Goshawk perched on a pole. 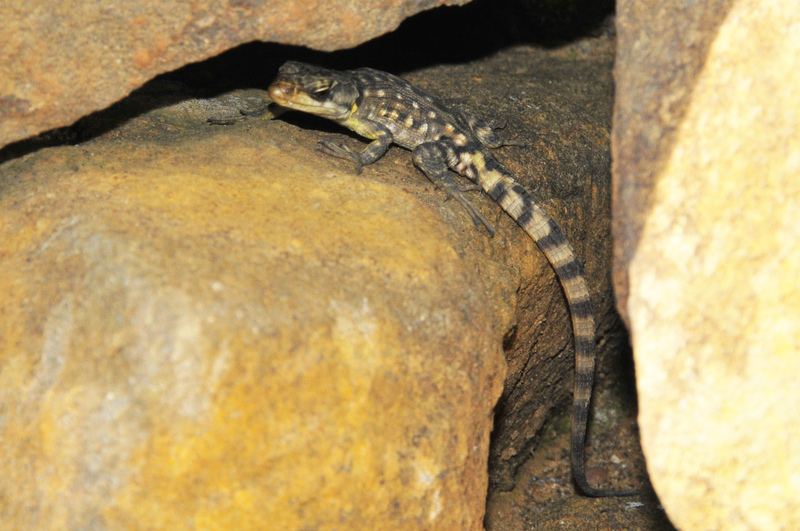 On the other list 3 out of the 5 species were Swallows – Greater-striped, SA Cliff and Barn Swallows.